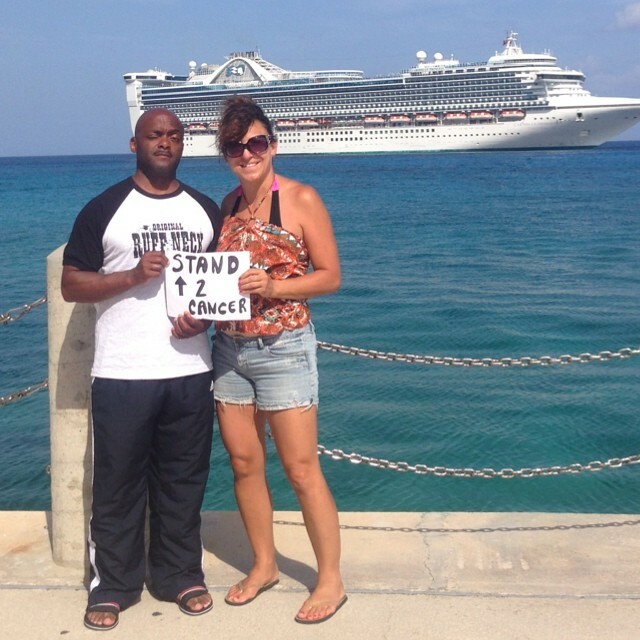 ﻿On February 27-28, 2015, Dancing With the Teachers will host their 5th annual event to support Stand Up To Cancer at the Fieldstone Middle School in Thiells, New York. Please join us in wishing them the best as they continue their extraordinary work. 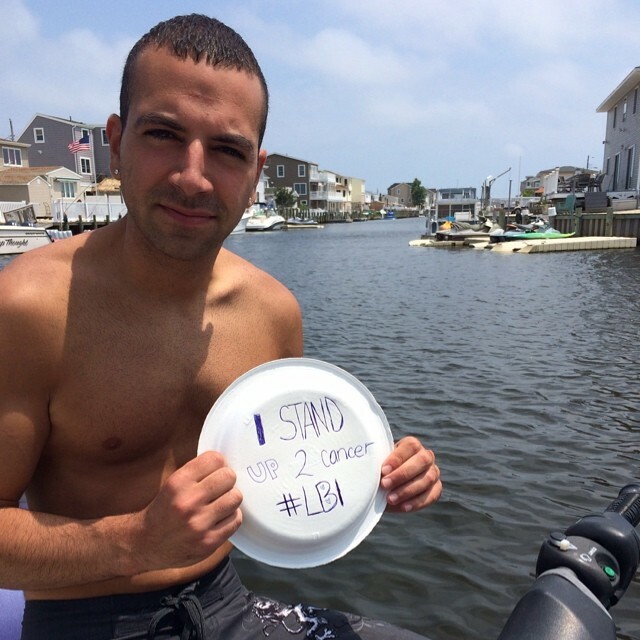 Do you Stand Up To Cancer? 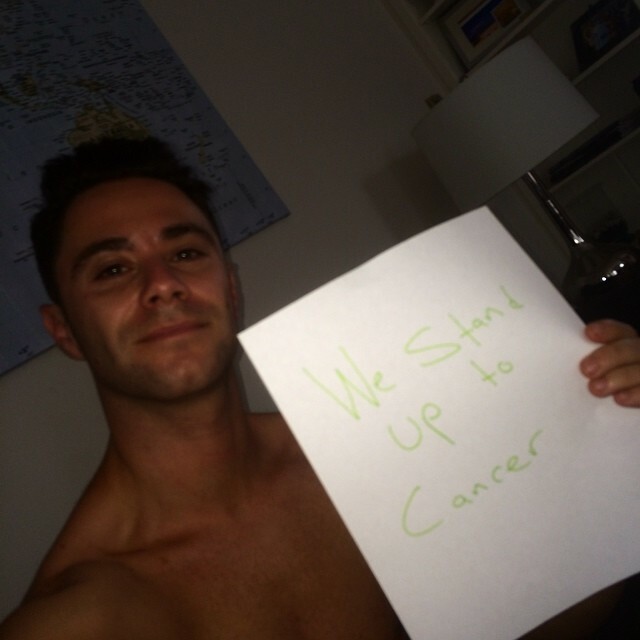 Our good friends from Dancing With the Teachers support Stand Up To Cancer not only with their annual benefit but they also work hard 12 months out of the year to get the word out about this very important cause. 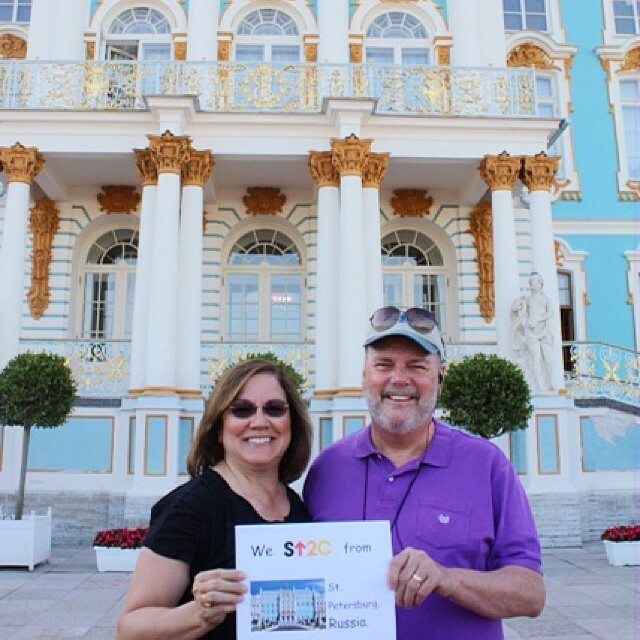 This summer they have encouraged their friends and supporters to send in photos from their travels while holding a SU2C sign, wearing a SU2C t-shirt, or just by making their presence known in this #DWTTSU2C contest. 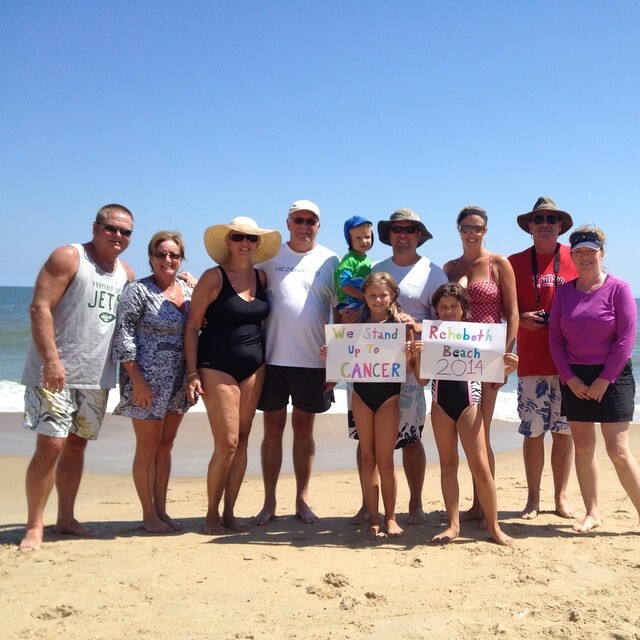 We hope you enjoy their photos and we encourage all of you to Stand Up To Cancer! 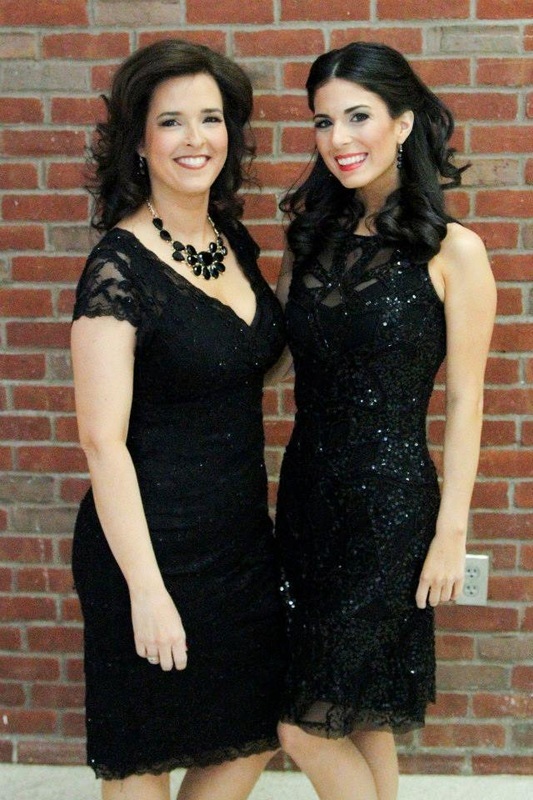 If you haven't read it yet, our full interview with Jennifer and Amy from Dancing With the Teachers (along with photos from the benefit performance) follows the contest photos. 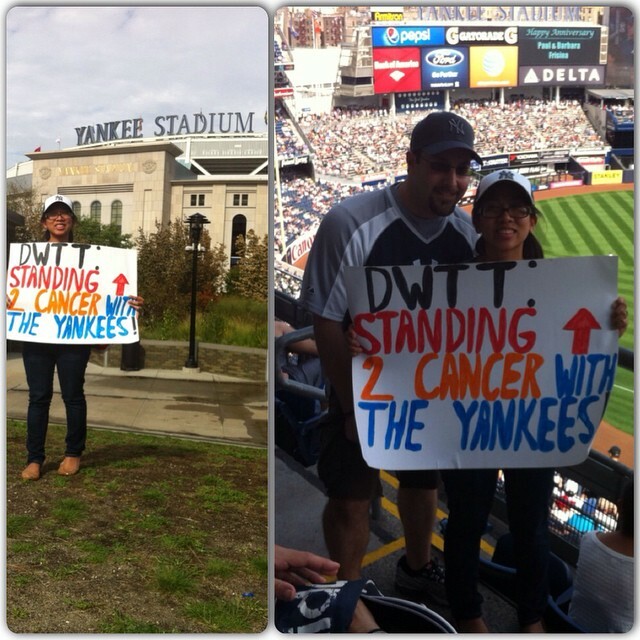 All photos are provided courtesy of DWTT/SU2C Instagram. Website Administrators: Several weeks ago we noticed a Tweet to Tristan MacManus from @DWTTSU2C. In that Tweet, an annual fundraising event was mentioned, and we were immediately intrigued. We began following Dancing With the Teachers/Stand Up To Cancer, and we soon realized that this was no ordinary fundraiser and that we had to become involved and help in any way that we could. 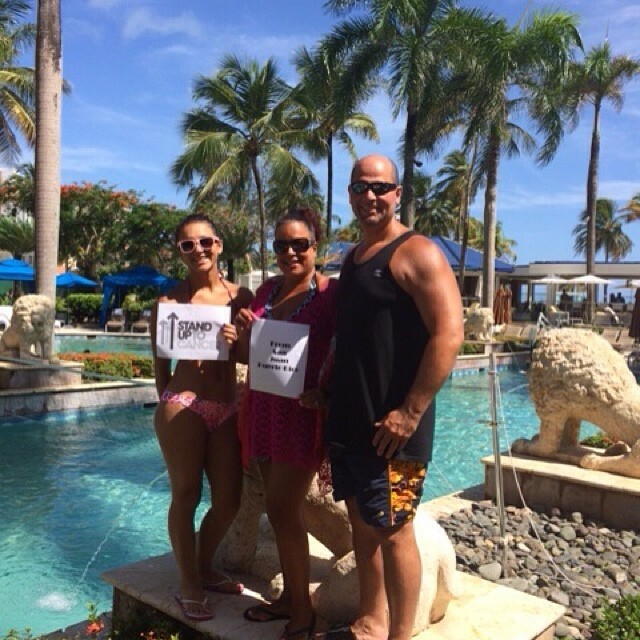 We approached Amy Leibel and Jennifer Harrington and inquired about the possibility of an interview. 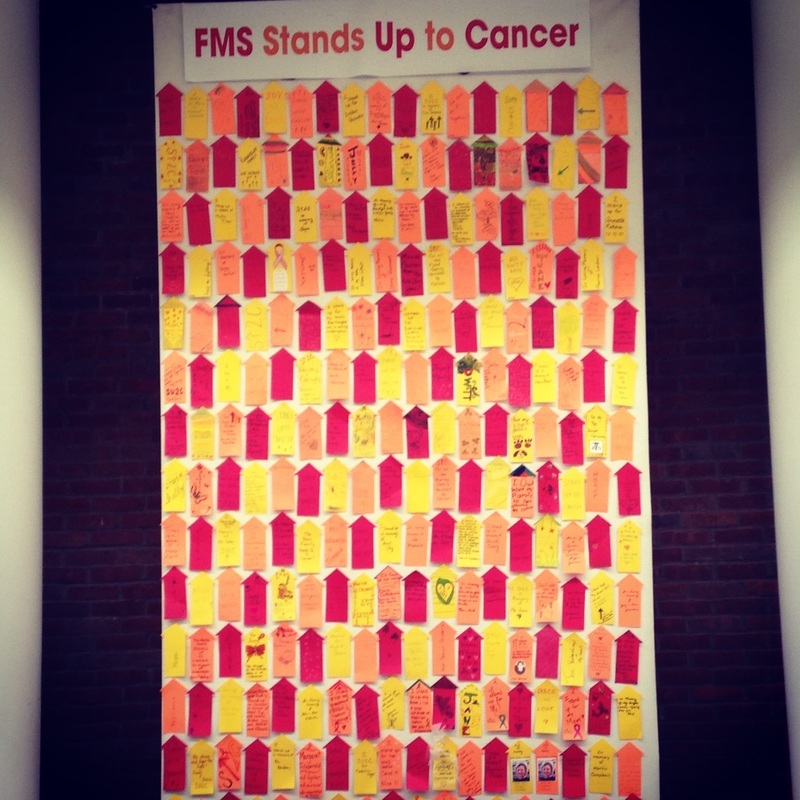 They graciously agreed, and below is a fascinating history of what has become a huge fundraising effort for Stand Up to Cancer by the faculty and students of Fieldstone Middle School in Thiells, NY. We can all learn from them. Read on…. It certainly has come a long way. When reflecting back on our journey over the past four years, we are overcome with emotion thinking about how far we have come. 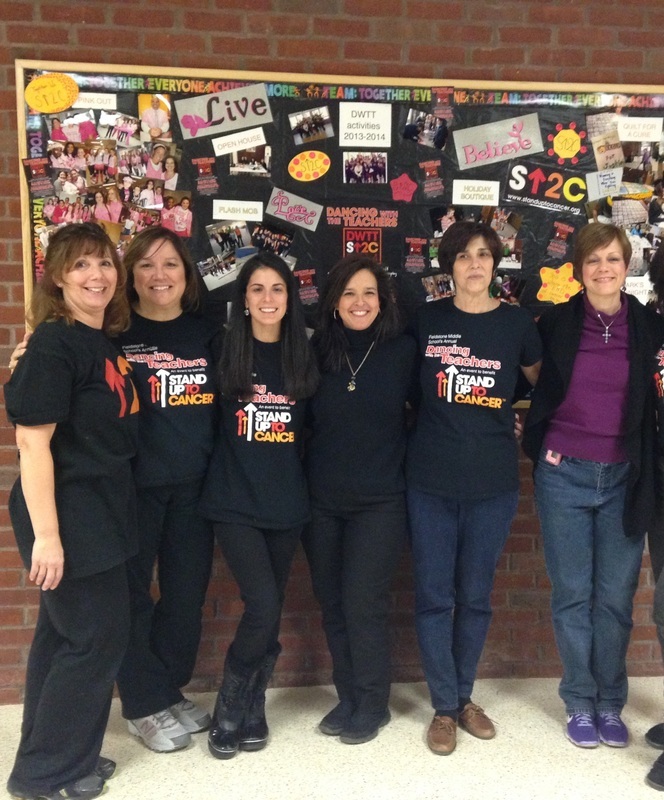 In total, Dancing With The Teachers has donated over $100,000 and counting to Stand Up To Cancer. Excitingly enough, we also just found out that Dancing With The Teachers was nominated and selected as a 2014 honoree for The One Hundred sponsored by Massachusetts General Hospital for our work. This event has united so many people together in profound ways, and like every great journey, ours has a beginning. . .
Our Dancing With The Teachers journey began in the fall of 2010 on a beautiful, brisk October day. Amy Leibel, an English Teacher at Fieldstone Middle School at the time, had an idea that she shared with her group of fourteen advisory students. 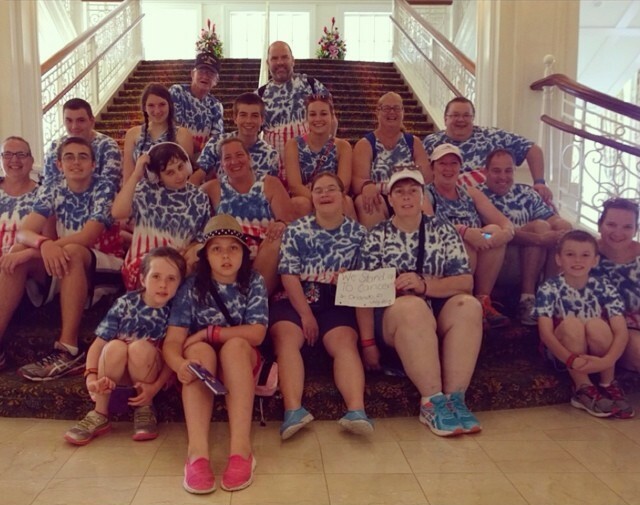 “I wanted to provide students (ages 12-15) with an opportunity to experience the incredible feeling of pride that comes with working hard to achieve a goal.” Amy had the idea to have her students organize some sort of fundraiser. Various ideas were thrown around the classroom such as car washes, bake sales, and candy drives, but none of those ideas seemed original or meaningful enough. 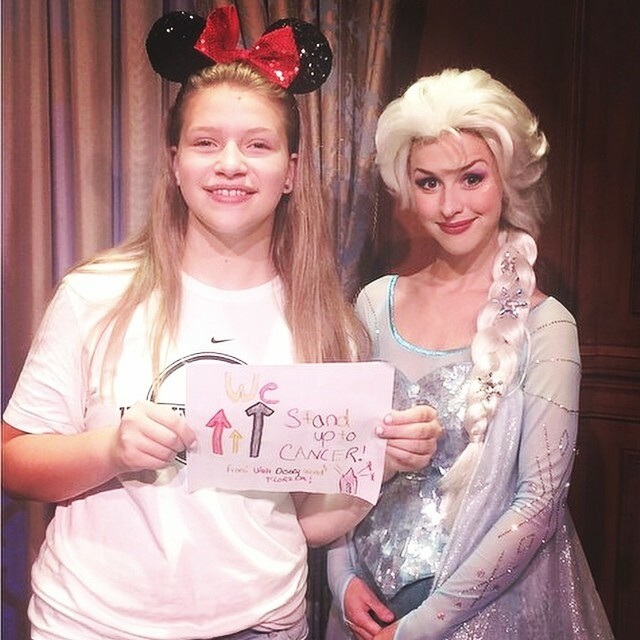 After talking about various charities, Amy and her students, decided that they would set a goal to raise $1000 for Stand Up To Cancer (SU2C), an organization dedicated to fund research to find a cure. 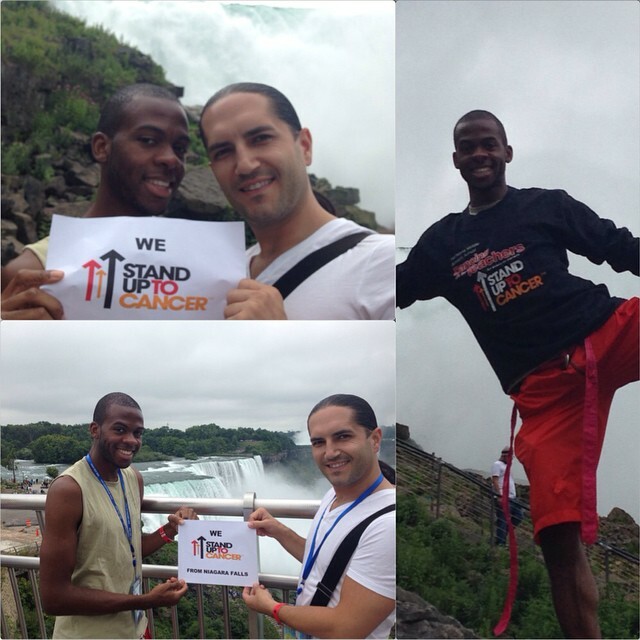 What we love most about Stand Up To Cancer is that 100% of donations go directly to cancer research dream teams. SU2C believes in bringing together the best and brightest scientists and doctors in the country to work together to find a cure in collaboration instead of competition. It was a cause to which EVERY student felt a strong connection. A few days had gone by, and we still hadn’t decided on a HOW to raise the money. That night, Amy went home and began racking her brain about what type of fundraiser to hold. By pure fate, Dancing With The Stars happened to be on TV. A light bulb went off! Amy shared her vision with fellow Fieldstone teacher Jennifer Harrington, and the two of us could hardly contain our excitement. The next day, the idea was presented to the students. 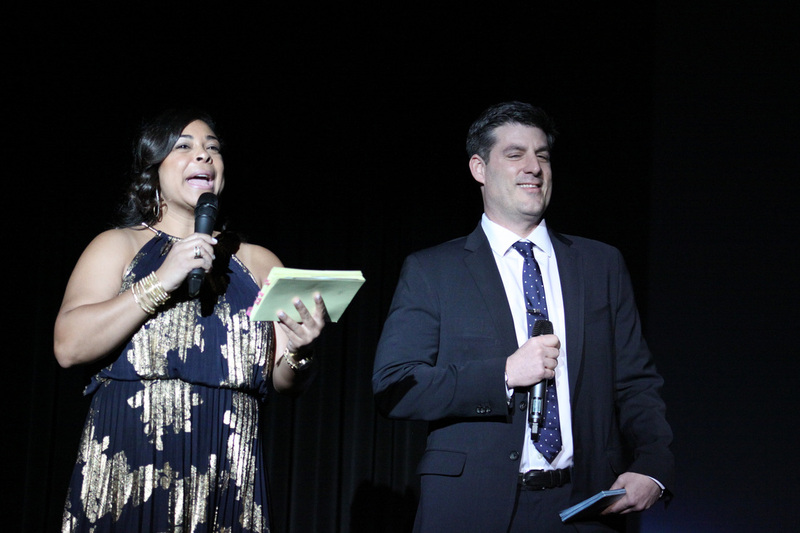 We asked them, “Would you pay money to watch your teachers get up on stage and dance?” The students in unison excitedly exclaimed, “YES!” So the two of us, with our student advisory groups, began to work together to raise funds. It was then that Dancing With The Teachers was truly born. We have formed a lasting partnership and friendship, and continue to dedicate ourselves to the cause to ensure that Dancing With The Teachers will always be a success. Now that our students’ minds were set about making this event a reality, we had a lot of pressure on our shoulders to make sure it actually COULD happen. 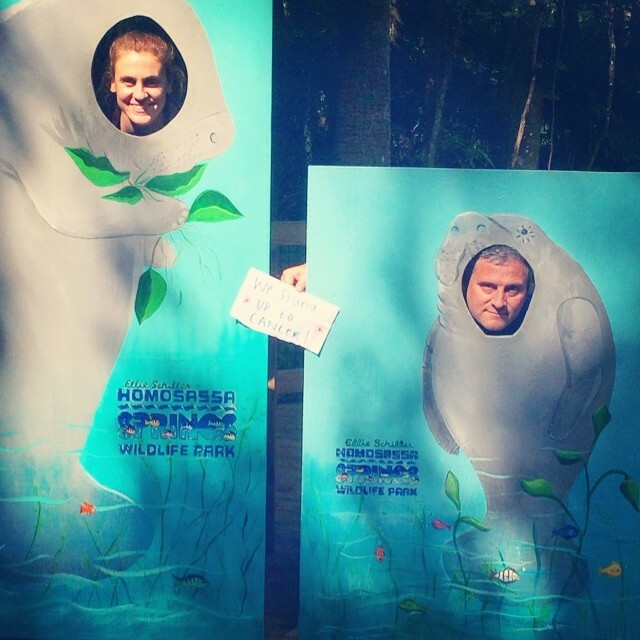 First, we had to find teachers who would be willing to participate as contestants. An event like this had never been done before, so there was a lot of hesitation that first year from the faculty to participate. . .and understandably so. 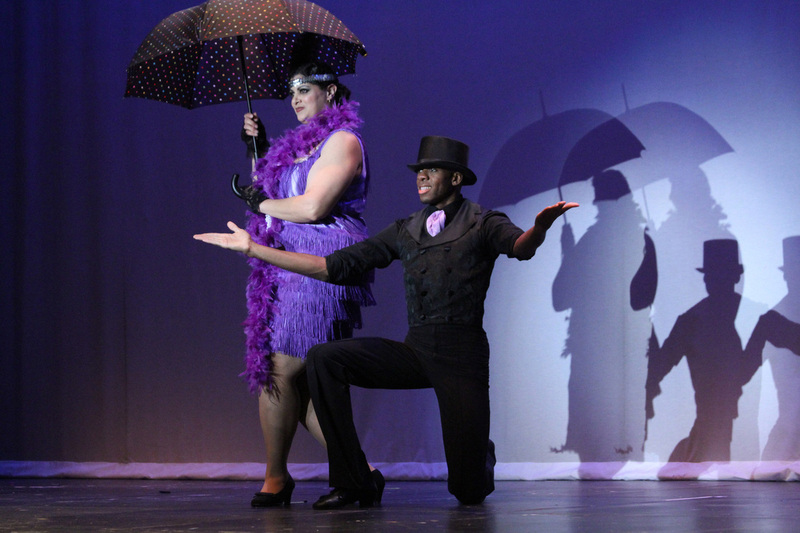 A few days later, an e-mail was sent out to the Fieldstone Middle School, faculty to see who would be interested in taking private ballroom dancing lessons, rehearsing, and ultimately performing their routine in front of an audience for the final show. Without knowing exactly what to expect, seven very brave faculty members volunteered to be the first ever DWTT “contestants”. We decided that if we were going to ask our co-workers to dance, then we needed to take a leap of fate ourselves, so the two of us rounded out the contestant pool. 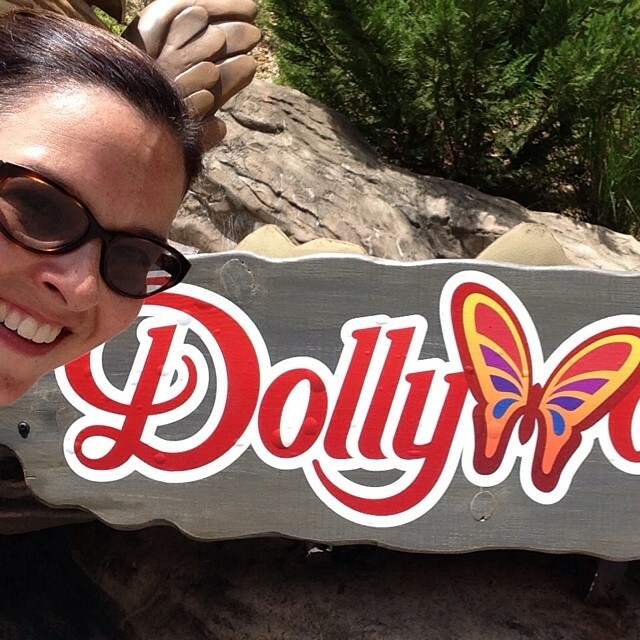 That made a total number of nine contestants for Season 1 of DWTT. Most of the people who volunteered had no prior dance experience whatsoever, but had a very personal connection to cancer. Many of us have watched loved ones battle this disease, and so we all wanted to do something to make a difference in the fight. Why not dance for a cure? With all the puzzle pieces falling into place, after partnering with NY DanceSport of New City, NY (more on this endeavor later), planning for the event was in full swing. 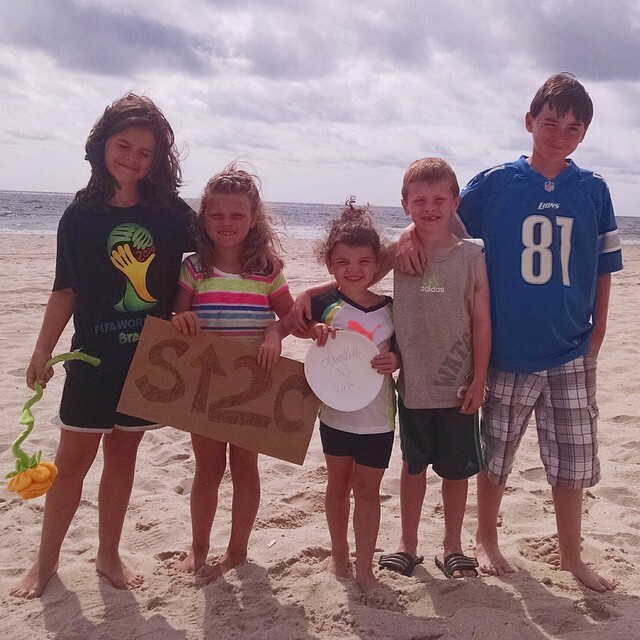 Over the next few months, something wonderful began to happen in the hallways and classrooms at Fieldstone, as the school became united in an unstoppable movement to raise money for SU2C. The night of the first event finally arrived on February 11, 2011. When the show began, and the lights dimmed in the packed 800 seat auditorium, there was a true sense of magic and emotion in the air. For all of the teachers and students involved, this was the moment when the feeling of success for what we had accomplished really sunk in. 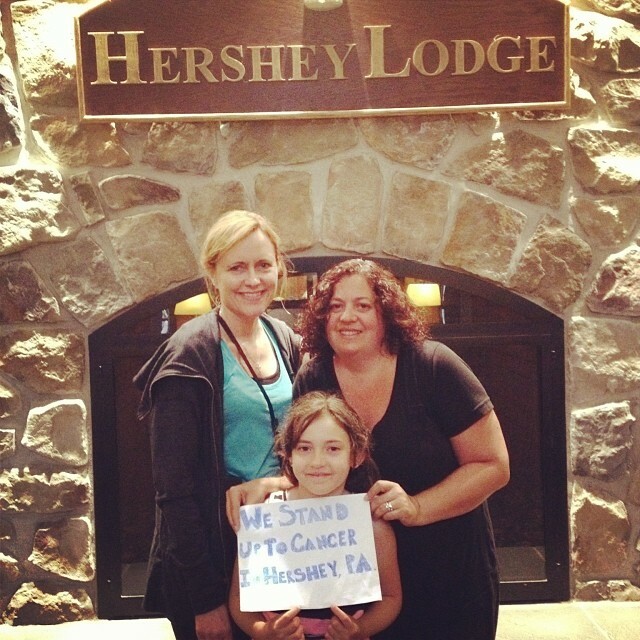 In that first year, Fieldstone donated close to $14,000 to Stand Up To Cancer. In 2012, our Dancing With The Teachers event blossomed into something even more powerful than was originally conceived. Ten new teachers volunteered to become contestants for Season 2, and they all delivered amazing performances. 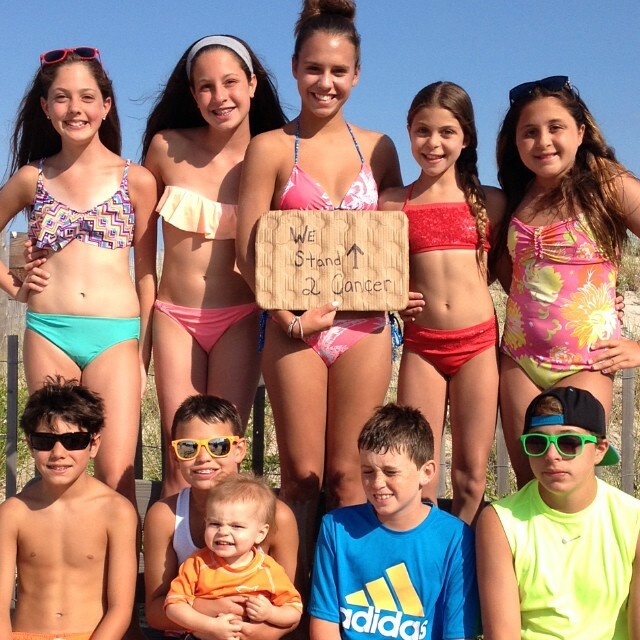 Jen and the students in her advisory group, F.L.A.S.H. (Fieldstone Lends All Students Hands), led the movement in the school. The students were enthralled at the thought of raising money for SU2C. 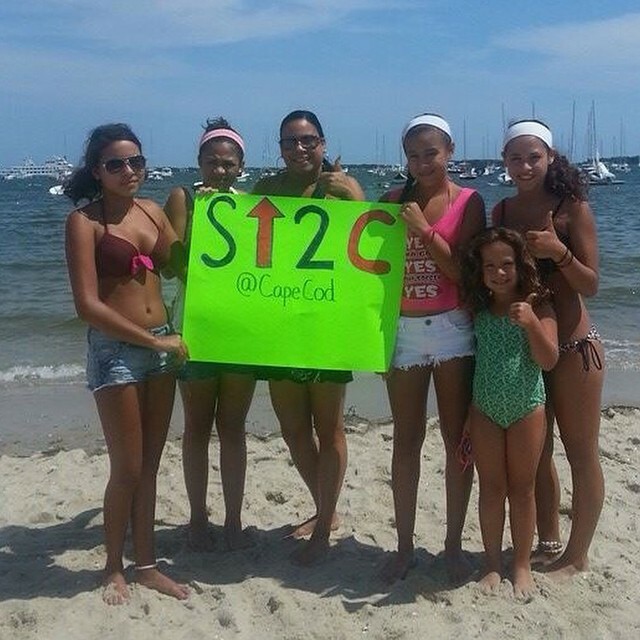 These students truly began to embody all the qualities of an ambassador for SU2C. Most gave up their lunch periods and free time to sell arrows to create the wall of support displayed in the main lobby, sell tickets, and involve themselves in all aspects of the planning process. 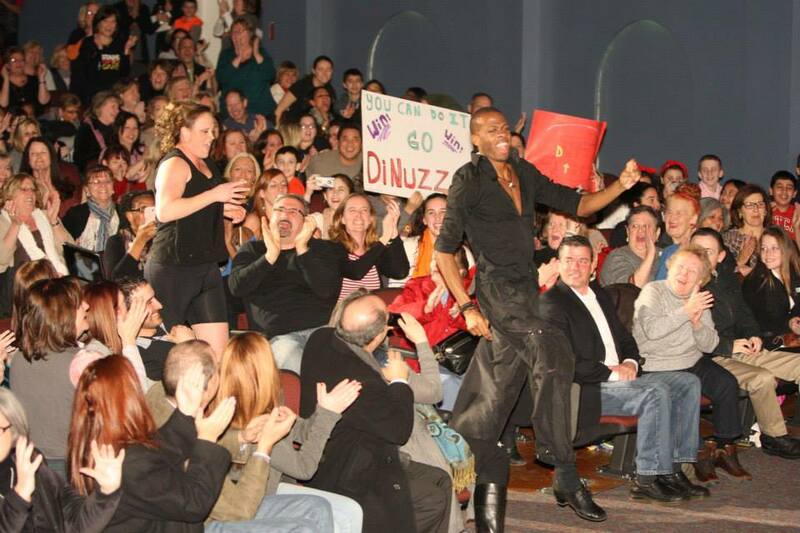 The second annual show was even more successful than the first, as the 2012 event raised and donated $20,000. 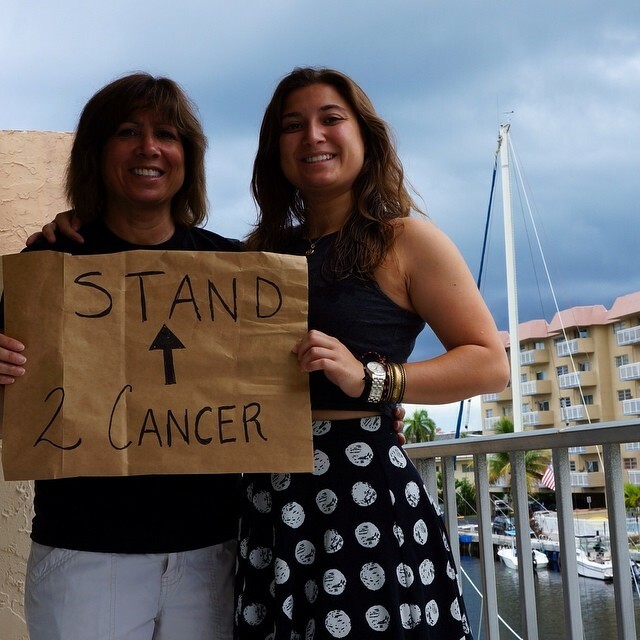 We (Amy and Jennifer) were honored to receive an invitation to attend the Stand Up To Cancer National Telecast in Los Angeles California in September 2012 for our efforts. Upon arrival, we were humbled to be in the company of the top doctors and scientists in the field, cancer patients and their families, and many survivors. 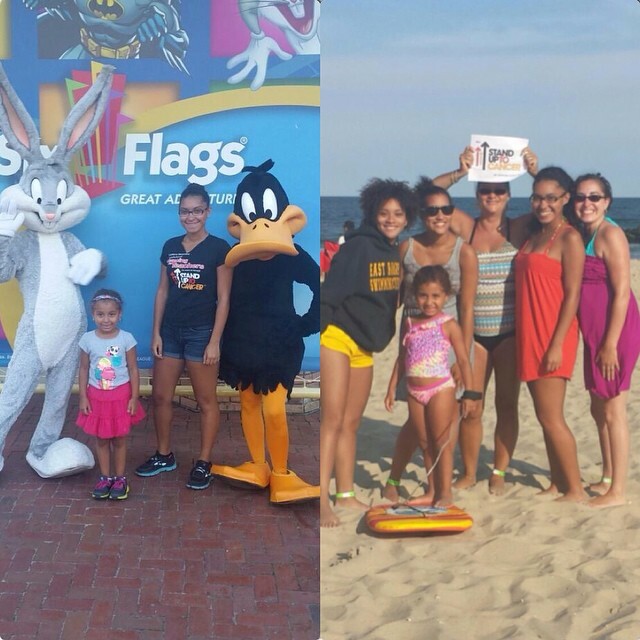 We even met a few celebrities! Although there were only two tickets, we told everyone we came in contact with about the amazing community of students and teachers at Fieldstone. It was a once in a lifetime experience that we both will treasure forever. Last year’s show (2013) was comprised of many unforgettable moments. 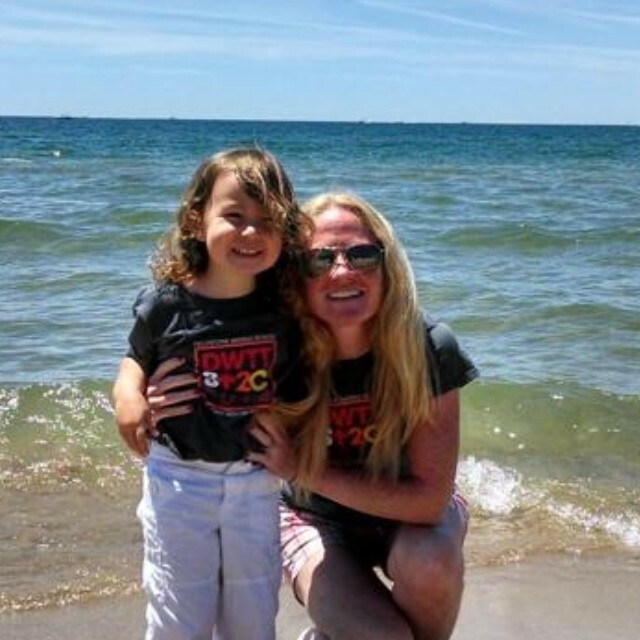 Pearce Quesenberry, childhood cancer survivor and SU2C ambassador, spoke candidly about her personal battle and the research trial treatment that saved her life. 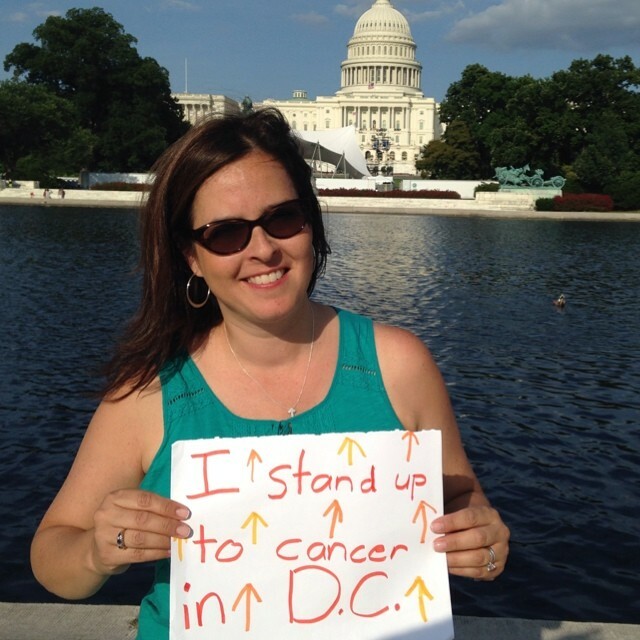 Kathleen Lobb, SU2C co-founder, proudly shared that DWTT was one of the top ten grassroots fundraisers in the country. Packed with spectacular performances and moving messages of hope and love, it was a very powerful show. In May, we had the honor of presenting Katie Couric with a donation check for $23,000 on the set of her television show. That next month, the DWTT team travelled to NYC to attend a press event for the groundbreaking Ken Burns documentary based on the book Cancer: The Emperor of All Maladies which will premiere on PBS this spring. 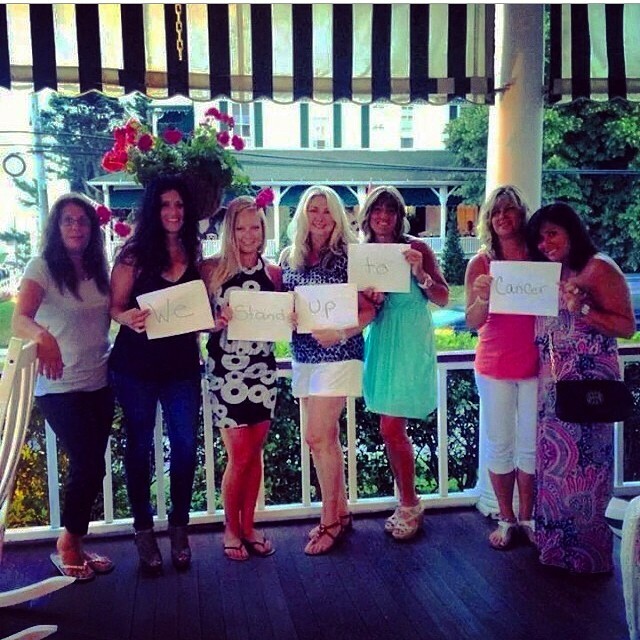 This journey brought us together again in 2014 for the Fourth Annual Dancing with the Teachers event. This year ten new faculty members competed for the Mirror Ball Trophy as they danced for a cure in the first ever two-night event. Our purpose for deciding to make our event two nights was simple… last year our show sold out in less than thirty-six hours! Many students and members of the community were unable to get tickets because of how fast the tickets sold. It was decided that we needed to give the community more, and therefore, we moved to a two-night format. We decided to dedicate each performance in honor of two very special women who had lost their battles. Friday night was dedicated to Jackie O’Grady, mother of one of our DWTT student leaders Kylie O’Grady, who lost her battle in April 2013, only a month after our 2013 event. Saturday night was dedicated to our amazing friend and school nurse, Lorraine Brenner, who lost her battle in August 2013. The exact same show was performed two nights in a row, with the potential for different winners each night. For our Friday night performance we secured three celebrity judges to add a new twist to our format. By the end of our fundraising efforts this year, we raised over $45,000 in 2013-2014. 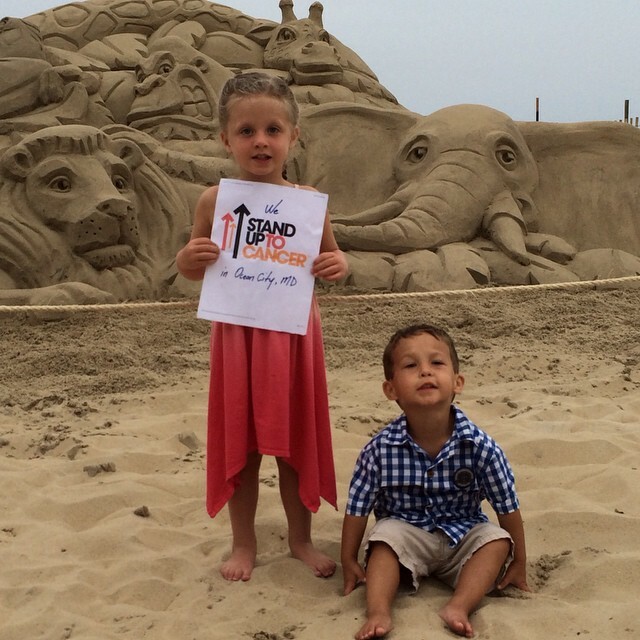 This brings our four year total donation to SU2C to over $100,000. With that said, we are now in the top three grassroots fundraisers in the nation for Stand Up to Cancer. This is something that we are beyond proud of and could never have imagined back when this project started. NY DanceSport has trained a total of thirty-nine teachers and faculty members, many of whom had no dance experience whatsoever, to take a giant leap of faith and dance. This event has become a four-year journey during which the lives of many of the people involved have been touched and changed forever. An entire generation of students, grades 7-12, have exhibited a sense of compassion and empathy for others and should feel empowered to know that they really have made a positive difference in the world. Retired teachers have volunteered tirelessly to organize and run our school fundraisers. 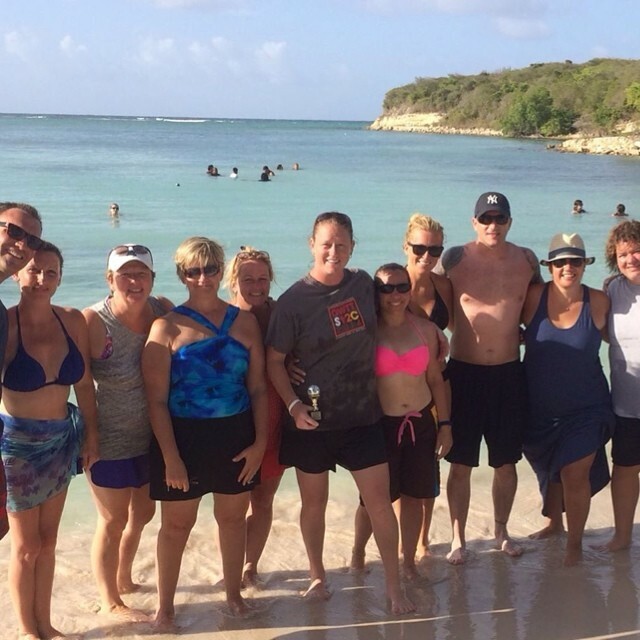 The faculty members who have been involved have formed genuine connections, friendships, and relationships that transcend the professional environment of a school. So many people have worked hard to make our show a shining example of how teamwork, dedication, strength, and caring for others can change lives in powerful ways. 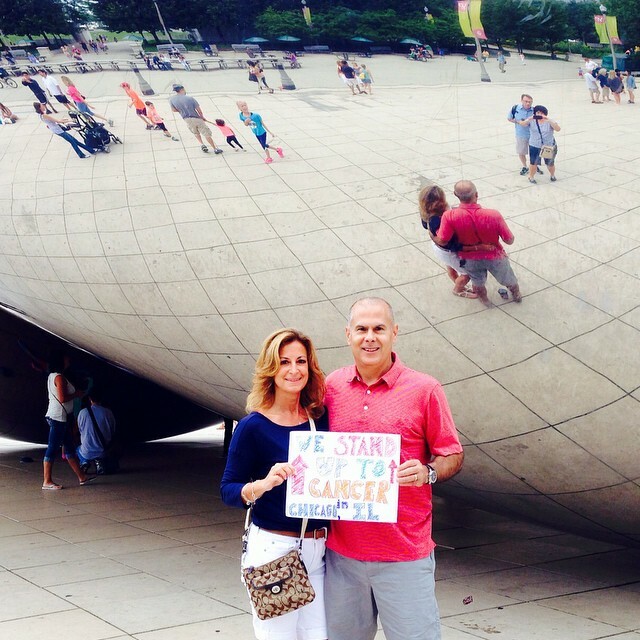 ﻿From a personal standpoint, you lost Lorraine Brenner, your school nurse and friend, to cancer. You mentioned that she had always wanted to dance in the show and that you dedicated this year’s show to her. 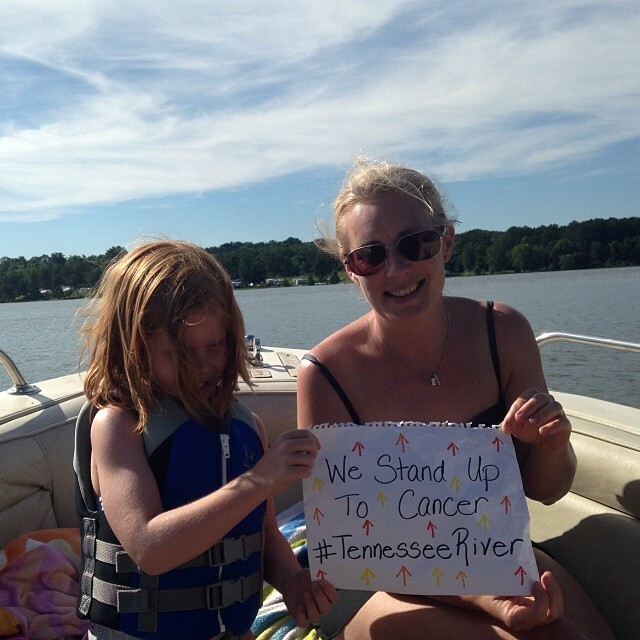 How did she inspire you to move forward and to keep up the fight against this horrible disease? Lorraine Brenner was, and continues to be, beyond an inspiration for us. She inspired us to move forward by showing us the true definition of strength. 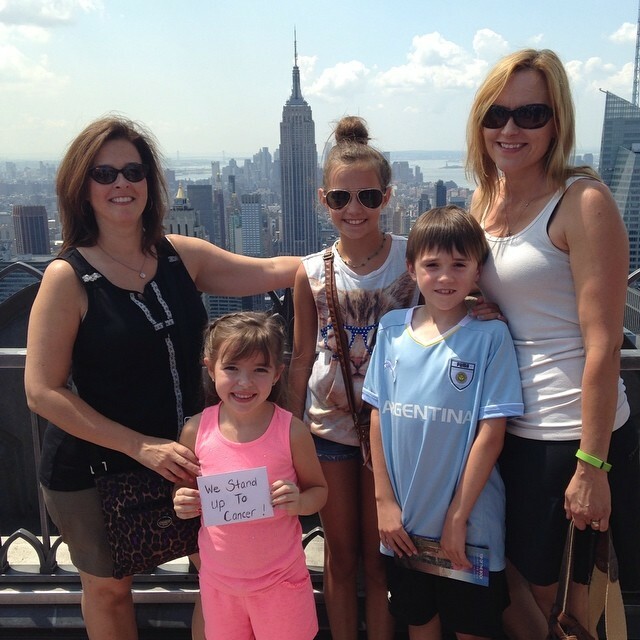 Lorraine was a loving mother of three beautiful children. She had been married to her husband for over 20 years. The two created a wonderful life together and their love for each other and their family was a shining example for our community of what true love really is. 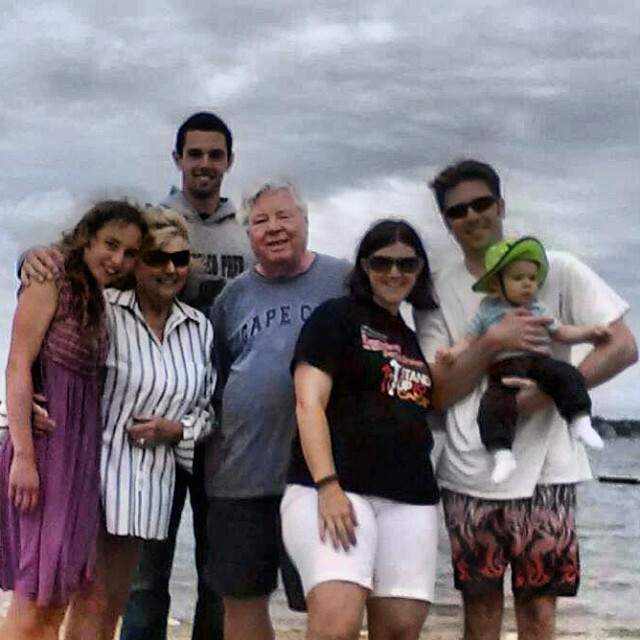 Lorraine was diagnosed with Breast Cancer and later Pancreatic Cancer. 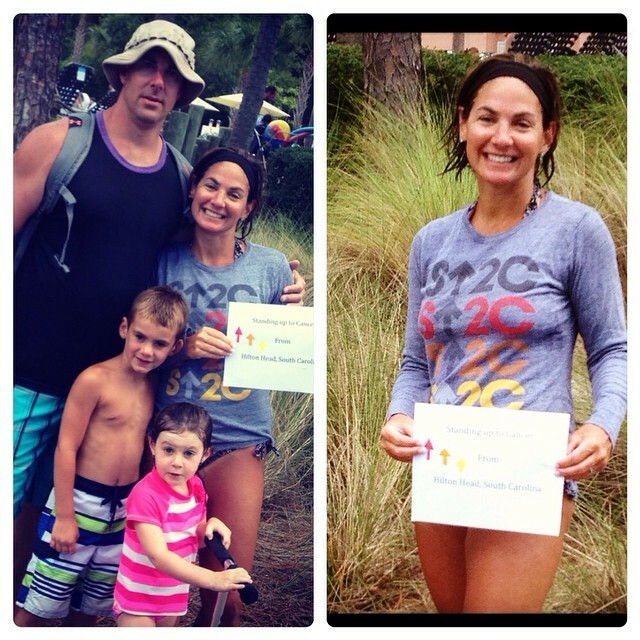 She underwent over 40 chemotherapy treatments and never lost hope. She was incredibly committed to helping behind the scenes with our show in every way that she could. She would sell concessions, collect tickets, and more. But as the years progressed, Lorraine’s health deteriorated. Regardless of the fact that Lorraine could not dance on stage, or even work the bake sale any more, she supported us by bringing over 40 members of her family to our show each year. And each year, after the show she would declare that as soon as she was healthy, she would dance on stage. We all had hope that this would indeed become a reality. 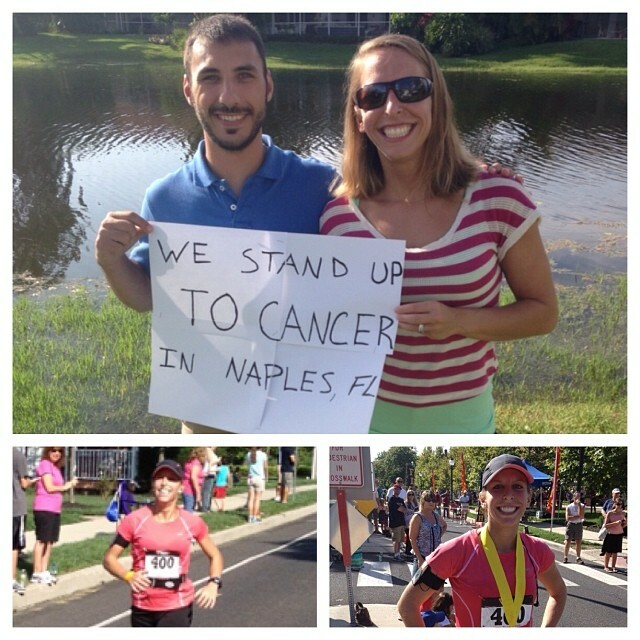 She was an unstoppable force, and we believed that she would beat her cancer. 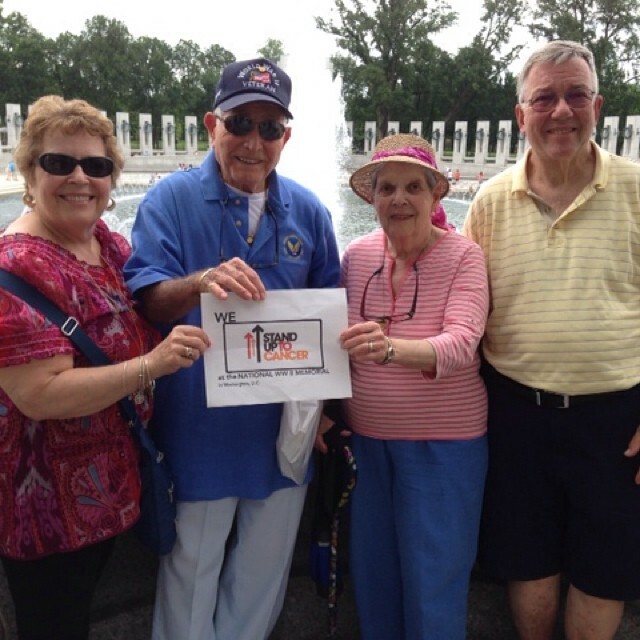 In 2013, a Los Angeles SU2C film crew directed by Jules DiBiase came to New York on the day of our show to do individual interviews with us on camera. 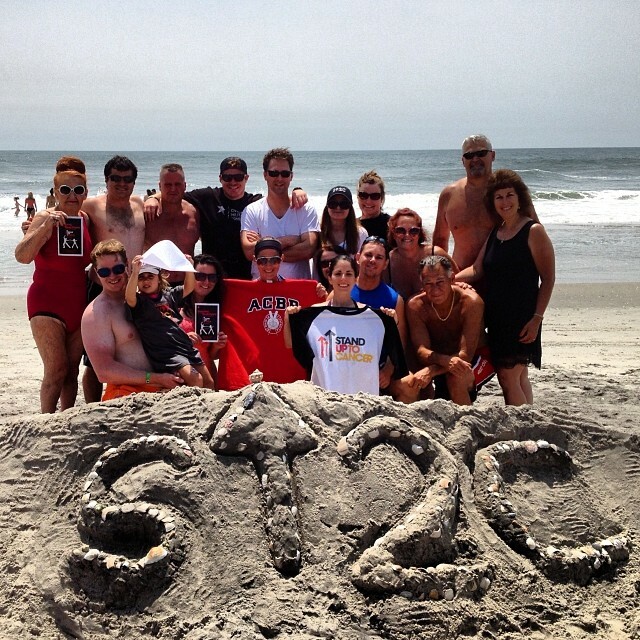 SU2C wanted to showcase our event on their website for the powerful work we were doing in our fundraising efforts. One of the people that they were very interested in interviewing was Lorraine Brenner; however, she had chemotherapy scheduled for that same day. Additionally, there was a blizzard that morning. Despite all of this, Lorraine’s strength and passion compelled her to come straight from her treatment, through the blizzard, to do the interview with us. That is the kind of strength that she exemplified that inspires us to press on in her name. Unfortunately, in the summer of 2013, just four months after that interview, Lorraine lost her brave battle with cancer. Our team was beyond devastated, as she was a wonderful and steadfast friend. Lorraine always said she wanted to dance with us, but she never got the chance. One night in January an idea struck Jen, and she made a call to Lorraine’s daughter, Melissa. 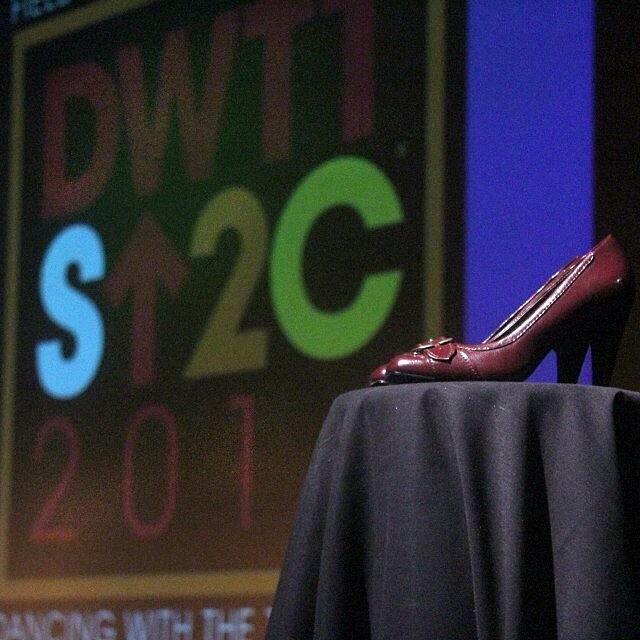 The idea was that if Lorraine physically could not be with us on stage dancing this year, we would love to have her shoes on stage as a way to symbolically have her dancing with us. Lorraine’s family loved the idea. Her shiny red shoes accompanied us to rehearsals, and to our show where they were displayed on a podium on the stage. Her husband and her children spoke at Dancing With The Teachers about the importance of this event, and how much the support of our community meant to Lorraine. Her family joined us on stage to dance in our show finale. The entire cast, accompanied by the entire Brenner family, danced to PINK’s song Raise Your Glass, as we all raised our glass in memory of our beautiful Lorraine Brenner. We have a saying between us that it truly “takes a village” to make Dancing With The Teachers happen. There are so many students, teachers, staff and community members who volunteer to support the cause. Our DWTT core team who dedicate the most amount of hours to the project consists of both of us, Claudia Brand - a physical education/health teacher, Carolann Ryan - a school Library Media Specialist, Michele Sassone - a math teacher, and Luz DuBois - a retired bilingual education teacher and breast cancer survivor. The six of us spend many Saturdays around a table at a local diner. Whether it is staying at school until 9:00 at night to organize and sort 700 t-shirts to sell as a fundraiser or decorate the main lobby for the night of the show, we band together to give all of our energy to this cause. We could not do it without their help and support. The show itself takes months of planning, but our fundraising efforts started the first day of school in September. Throughout the school year, we do “mini-fundraisers” each month to increase our overall donation to Stand Up To Cancer, along with spreading awareness for the ground-breaking work that this charity does. This year alone the amount of fundraising we did was unprecedented and included some of our most creative feats. The number of volunteers it takes to “make it happen” is unbelievable. 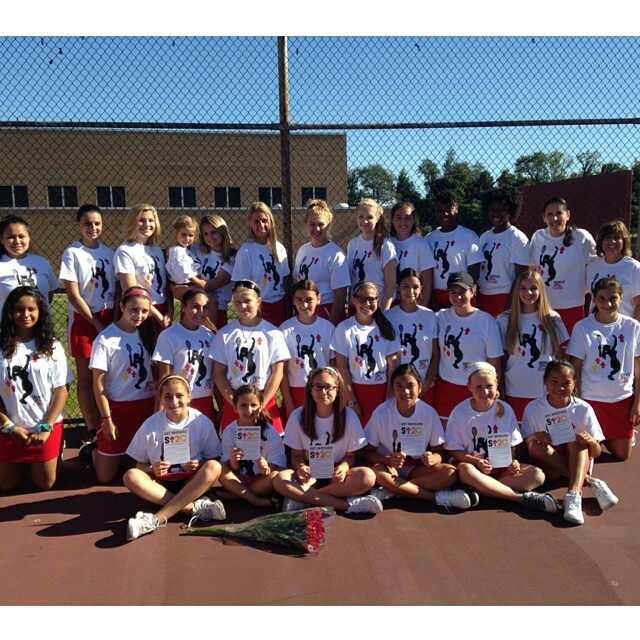 We recruit about 50 students each year to run these fundraisers. We also reach out to local businesses and ask for donations of time and materials. Additionally, we have over 150 faculty and staff members who pitch in in various ways. Whether people bake brownies, or sew an entire quilt together, many hands make light work! 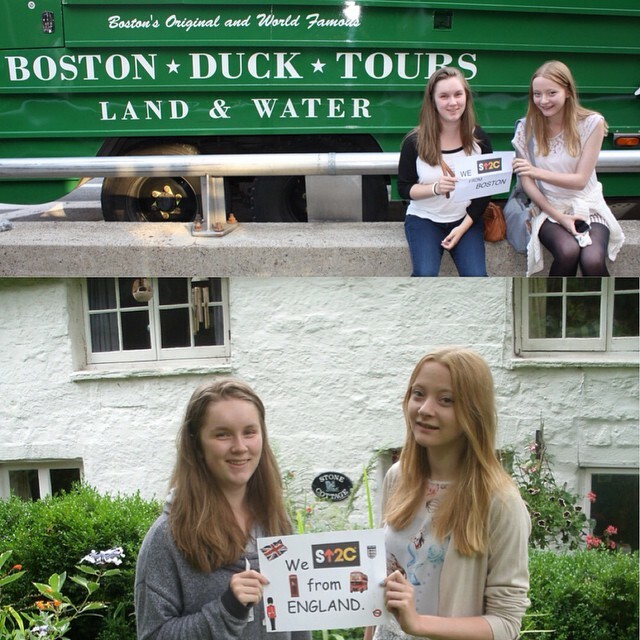 In September we sold handmade bracelets which were made by student and staff volunteers in the SU2C colors. In October, we held a school wide Pink Out for Breast Cancer awareness month. For the Pink Out our DWTT teammate, Claudia Brand, led the charge by teaching us how to tie-dye. We tie-dyed over 100 t-shirts in various colors of pink and sold them. Additionally, Luz DuBois went to the Cornwall Yarn Shop and asked if customers who frequent the shop would be interested in volunteering to donate their time and yarn to knit breast cancer awareness ribbons for us to sell. Over 200 ribbons were hand made by those customers and were donated to us to sell. We also sold pink socks, wristbands, pencils, pens, and much more. The culminating event was a school wide Pink Out in late October where all faculty, staff and students wore their pink to raise awareness. Additionally, at the end of October in collaboration with NY DanceSport, we organized a Flash Mob of over 100 people at the Palisades Mall in West Nyack, NY. The huge crowd of unsuspecting shoppers were so impressed by the surprise dance performance that they threw donations down from all four floors. It was very exciting! 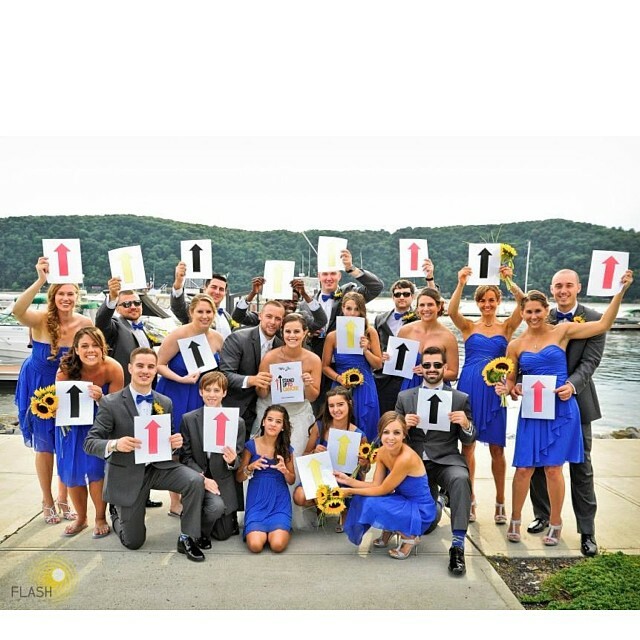 Even though he had never been involved with the project before, a local North Rockland community member named Tom Ossa, owner of Rockland Web Design, volunteered to pay a professional videographer to record the entire Flash Mob. In November we sold Italian Ice to our students during our lunch periods. As December approached, North Rockland High School, donated a table to us at their annual holiday boutique. We began handcrafting everything from Christmas ornaments to hand drawn holiday cards. We used the talents of our students and our team to create as many unique gifts as possible, and our table was a huge success. 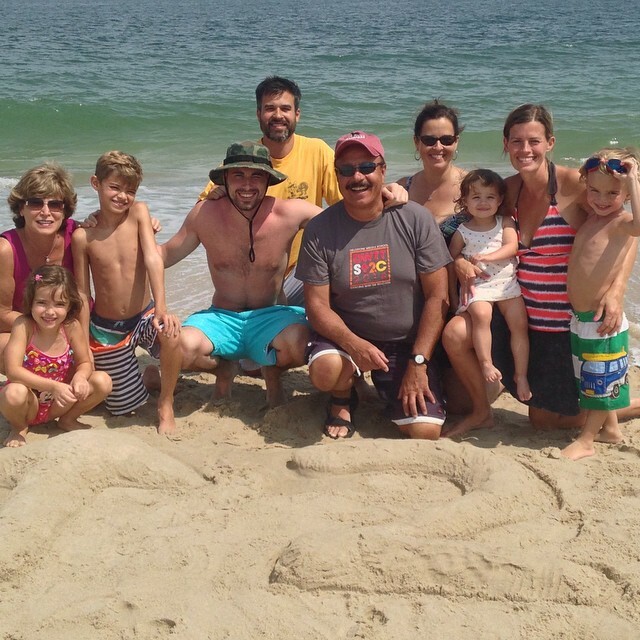 In January we embarked on a powerful journey to create a “Quilt for a Cure”. Last summer, in one of our brainstorming sessions, Jen came up with the idea of “sewing the community together with a common thread”. Since cancer has been a cause that everyone feels connected to, we thought it might be powerful to make a visual display of our community united in the fight. Luz secured local quilters who not only vowed to donate their time to create the quilt, but also generously donated all materials needed for the project. We sold 10”x10” fabric squares to members of our community. We included directions with every square to use crayons to design each individual square with messages of hope and strength to honor loved ones affected by cancer or to show support for our cause. The results were overwhelming, and our quilters literally sewed together touching stories and tributes. 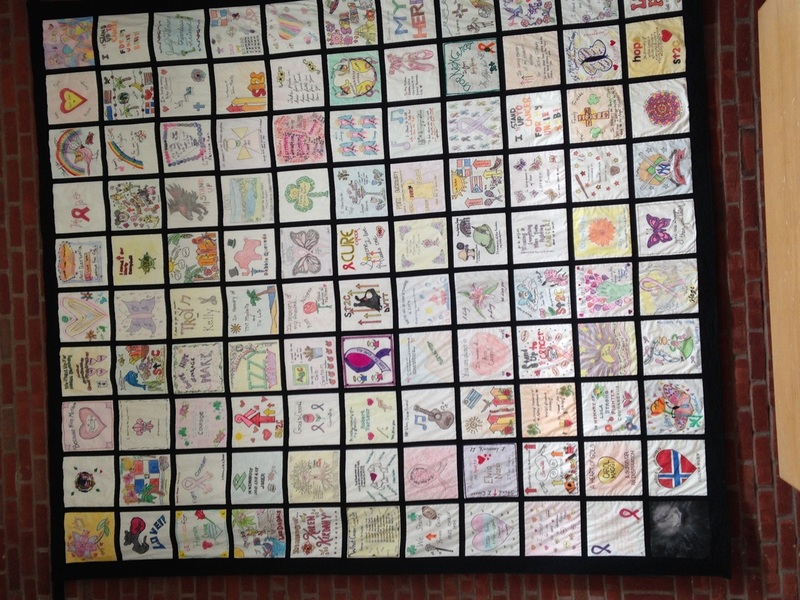 Ultimately, they created a 10’ x 11’ Quilt for a Cure which is prominently displayed in our school lobby. It is one of the projects that we are most proud of. In February we began selling our traditional Dancing With The Teachers merchandise which included t-shirts, pins, tote bags, and long-sleeved shirts. Once again we worked with Harrington Press of Nyack, NY to create a new logo for this year’s show. Not only does this print shop donate all of their artwork to us, but they also donate all printing services for tickets, flyers, posters, and our DWTT playbill. 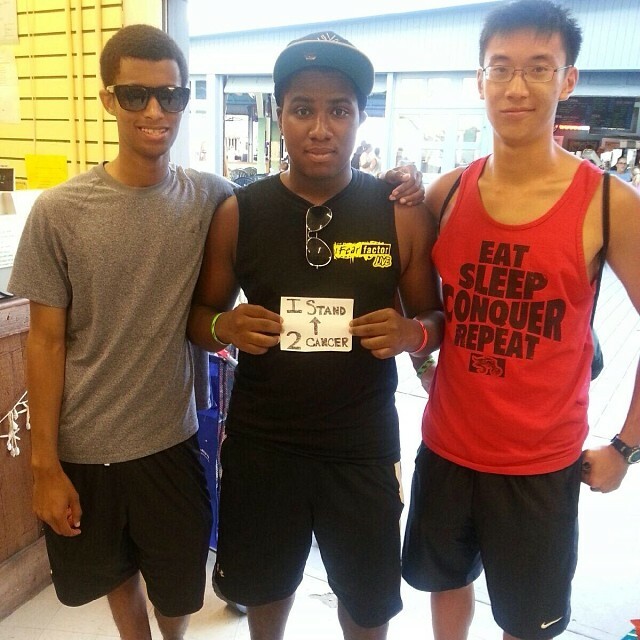 Businesses and individuals have the opportunity to take out advertisements in order to support the cause. After Michele Sassone and Carolann Ryan organize the ads, Harrington Press designs the layout. Printing the playbill, which is nearly 100 pages, is no small task since almost 800 copies need to be printed. In addition, they donate over 1000 dye-cut arrows to help us create our annual Stand Up To Cancer Wall. Each paper arrow comes in various Stand Up To Cancer colors and for a $1.00 donation, people can write messages of support and love on the arrows. Our students then use these arrows to create a “wall” as a touching, visual display of the hundreds of families affected by cancer. Our arrow wall, displayed in our school, continues to be built on the night of our performances in real time. By time our show is over, the lobby of our school is covered with messages of hope from those who “stand up” with us. We have satellite arrow walls in NY DanceSport in New City, NY and also in Riverview Nursery School located in Nyack, NY. It is truly unbelievable to see how many people this disease affects. The night of our show, there are well over 100 volunteers that arrive to help us run the production. 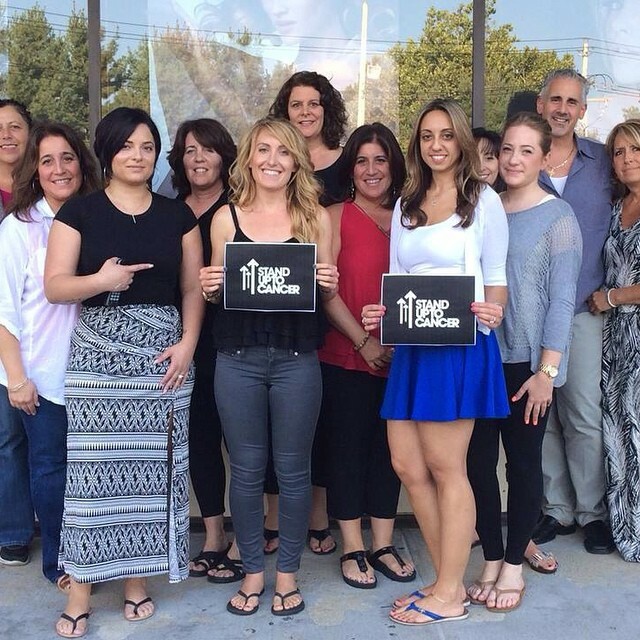 This year we had a local hair salon, Shear Magique in Pomona NY, agree to donate hair and makeup services for the contestants for both nights of the show. We also had a decorator, Laurie Straus of Confetti Party Decorating, who volunteered her services and built giant balloon displays. A local catering hall, Town and Country of Congers, NY, donates tablecloths to help us decorate our main lobby with elegance. We also had a local jeweler, Tammy Rosen of the Jewelry Gallery of Stony Point, NY, set up a booth at our show selling Alex and Ani Stand Up to Cancer bracelets. Tammy donated her profits from the sales to our cause. Barry Sabino, the owner of the Photo Shoppe of West Haverstraw, has been one of our greatest supporters since the very beginning. He photographs and videos our entire show and donates all services. Barry then sets up a booth at our show where supporters can pre-order their DWTT DVDs which he edits and produces. 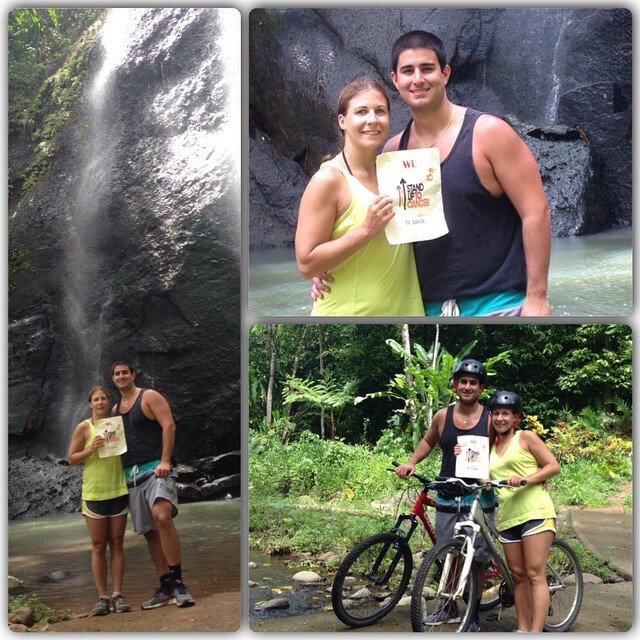 He graciously donates all money from the DVD sales to our fundraising efforts. Another local photographer, Sabrina Nicosia, also covers our event and donates all of her services and photos. Most of the pictures that you see posted on our sites are either Barry or Sabrina’s incredible work. There are also many other stations at our show that are run by volunteers including retired teachers, current teachers, staff members, community members and students. We have a 50/50 table, a merchandise booth where we sell Dancing With the Teachers gear, a station where we sell our arrows for our Stand Up To Cancer Wall, and we host an enormous bake sale in our cafeteria. What is the format for the show itself? Based on what we’ve seen, you use a number of professional dancers/teachers as choreographers and instructors. Has New York DanceSport been involved every year? One of the biggest challenges during the first year was actually finding a dance studio who believed in our idea enough to jump on board. The concept of Dancing With The Teachers is modeled after ABC’s Dancing With The Stars, so finding professional dancers was a necessity. 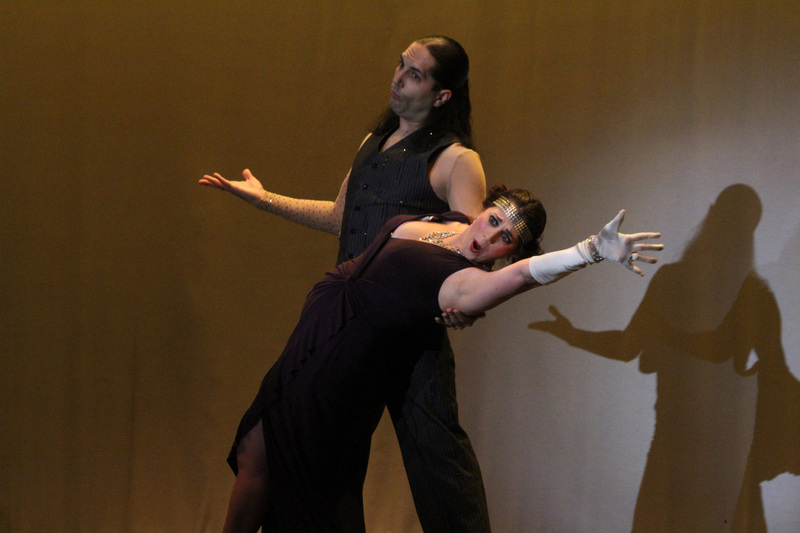 The format of the show consists of ten Fieldstone faculty members being paired up with a professional dance partner. Each contestant learns, rehearses, and spends months preparing to compete in a live dance performance. 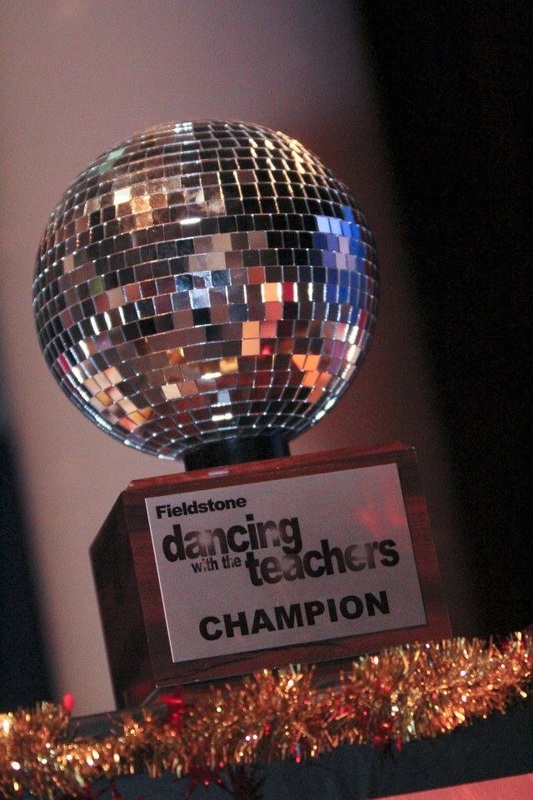 During our Dancing With The Teachers event, our contestants compete in front of an audience of nearly 800 people who vote to decide who takes home the coveted mirror ball trophy. Dozens of phone calls were made to EVERY dance studio in Rockland County. Most studios said that this sounded like a very “cute” idea, but that they weren’t interested. We can remember losing hope of even being able to find a studio and getting this project off the ground. Then, a phone call was made to NY DanceSport in New City, NY. We spoke to Igor Sharapanuyak, the manager and lead choreographer of the studio. 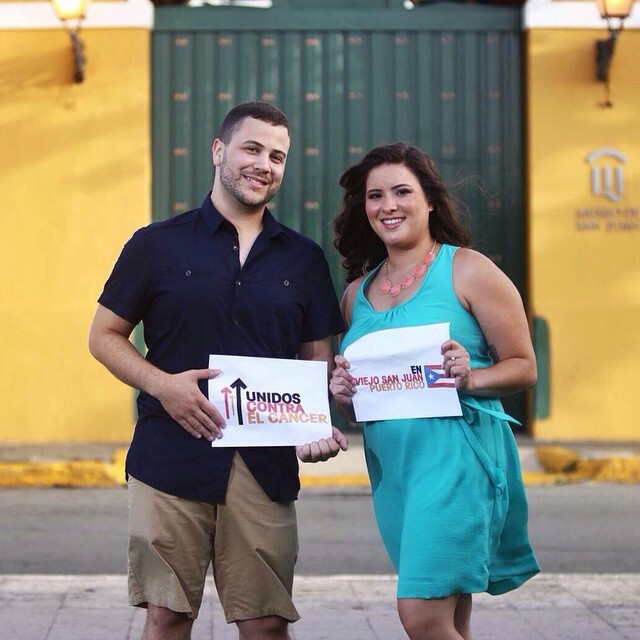 After explaining our idea, he said words that we will never forget…”LET’S DO IT!” The two of us often say that it was kismet or destiny that led us to NY DanceSport, as the entrance of these professionals into our all of our lives has been life changing. 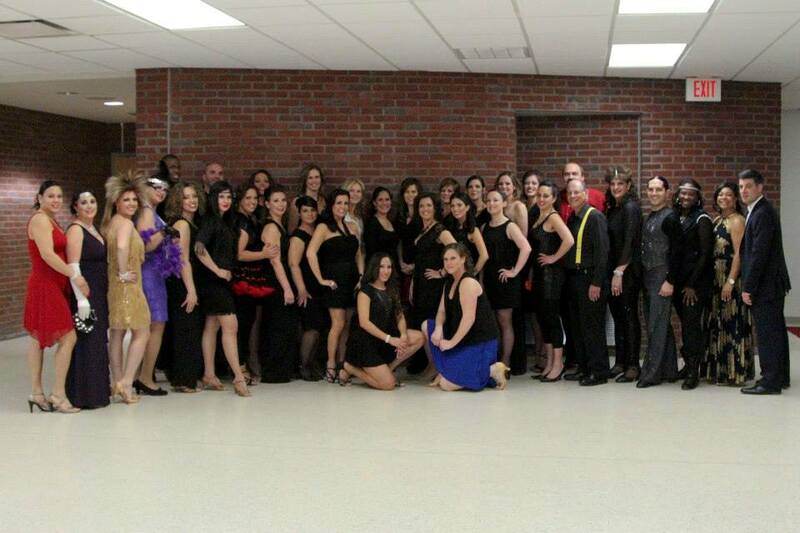 Since the very beginning NY DanceSport has been involved, and honestly we would be nowhere without their commitment. Igor and Nolan Josephs have danced in every single show, and Xiomara Forman has danced the past two years. Since there are only three total professional dancers, Nolan and Igor usually take on the responsibility of partnering with 3 or 4 female contestants, and Xio takes the male contestants. Each contestant is provided with six private dance lessons to rehearse and learn their routines. Most have had little to no dance experience before, so the time in the studio is so important. Igor, Nolan, and Xio are so incredibly talented, gifted, and most of all patient! Through their vision for the dance routines, they are able to help the contestants feel comfortable, confident, beautiful, and supported. In addition, they have a unique ability to choreograph dances to showcase the individuals’ strengths and help them shine from the inside out. Every year, we have ten new contestants. This means that basically, if you have competed in the past, you cannot compete again. So during Year Two we came up with the concept of building in a group dance number for DWTT “Alumni”. This way, past contestants can stay involved and still participate in the show. We all fell in love with dancing, so this is our way of continuing to dance. Both of us dance in the Alumni Number, and the size of our group gets bigger and bigger each year. 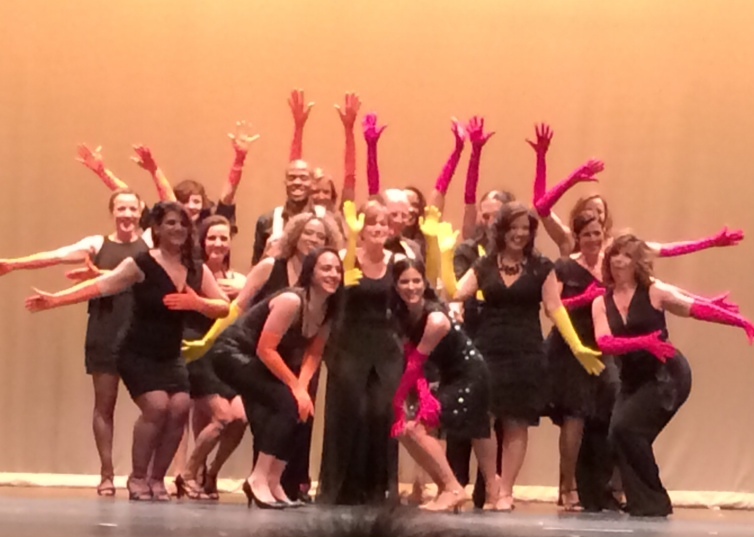 This year, our group dance featured a total of 16 past teacher/faculty contestants! We performed a Cha-Chamba (a hybrid dance of Cha-Cha/ Samba) to “Let’s Get Loud” by Jennifer Lopez. Since there were so many people participating in the Alumni Dance, we came up with the idea to have three different groups on stage. Each group wore different Stand Up To Cancer colored gloves (red, orange, and yellow). Small little details like this are what make our show really special. You can imagine the time, commitment, and organization effort it takes to get 16 people, all with families and full time jobs, on a rehearsal schedule that works for everyone. It isn’t easy! But it is their commitment to the cause that really is the driving force for success. The actual production of the show is also another huge undertaking, as we want the show itself to be of professional caliber. Contestants spend months rehearsing with their professional partners. Costumes are bought, hair and makeup appointments are booked. While all of this is happening, we write a script for our show with lines and every sound, lighting, entrance and exit cue is written. We are very fortunate to have the students from the high school stage crew run the show under the direction of James Huppert, the lighting and sound designer for the district. After a long dress rehearsal, where people are actually able to practice on stage for the first time, the show is ready to premiere. The first act of the show features the contestant acts, and then the audience votes during intermission. This year we launched, “text-to-vote”, and audience members used their cell phones to text the number of their favorite contestant - just like on TV! While the votes are being counted, the second act of the show features our Alumni Dance, tribute videos and slideshows, a musical performance, and one of the defining moments of Dancing With The Teachers - our “Stand Up Line.” The entire cast, hosts, judges, and many student volunteers stand united in one line across the stage and step forward one by one to speak the names of the people they stand up for. These names remain the driving force behind why we do this event. Even though we are not doctors or scientists, we MUST all do our part to help find a cure. Trying to keep the format of our show as close to Dancing With The Stars, we have always had two hosts and three judges who provide commentary throughout the show. The judges give a score after each dance (all our dancers are so amazing, so they all seem to get 10’s from the judges!) The judges scores do not count in deciding the winner...that is up to the audience. The first three years, we had three of our own Fieldstone faculty members, but this year we added a new element to our show. For our Friday night performance we secured three celebrity judges! We attempted to get someone from DWTS to come out to our show with little luck. Fingers crossed for next year! In the meantime, we were incredibly lucky to have three phenomenal celebrities join our cast. Sakina Jaffrey, from the award winning series House of Cards was the first to sign on. In addition, comedian Kerri Louise joined the panel. 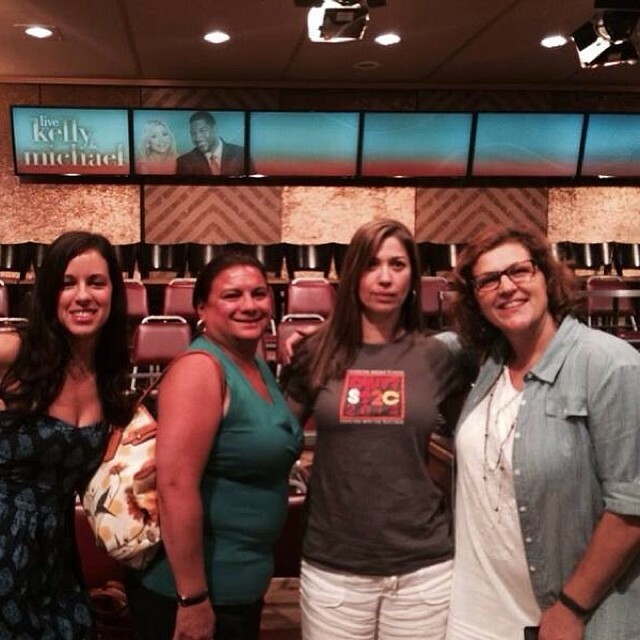 Kerri is best known as a finalist on Last Comic Standing. She has also been on Dr. Oz, The View, VH1, Comedy Central, 20/20, and more. She added such levity to our night. The beautiful Beth Chamberlin from The Guiding Light graced our stage as our third judge. Her background in dance and as a fitness instructor added a phenomenal technical aspect to the judges’ commentary. The celebrity judges really added a whole new dimension to our show! 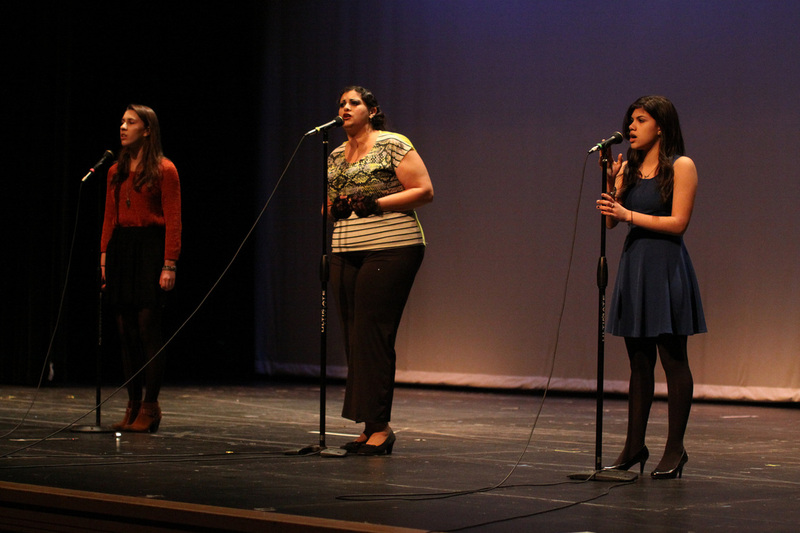 For our Saturday night performance, we had three of our very own staff members back as judges. Taking a great lead from our celebrities, they judged with humor, intellect and support. 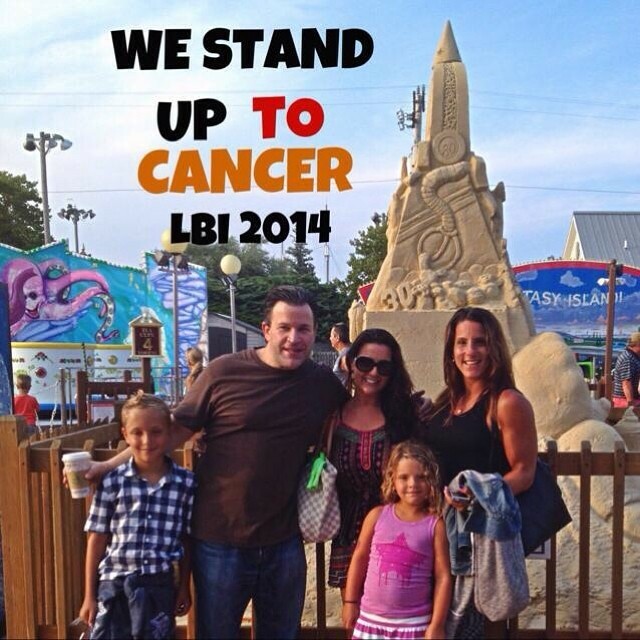 As stated above, in the past four years, we have raised over $100,000 for Stand Up To Cancer. We have counted every single dollar bill by hand, and it is extraordinary how much can be accomplished when a community comes together to raise money for a cause like SU2C. 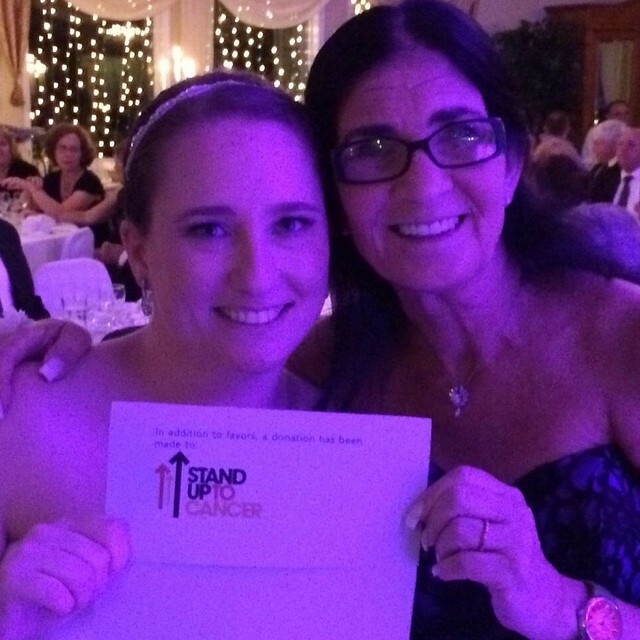 Stand Up To Cancer raises funds for innovative cancer research. 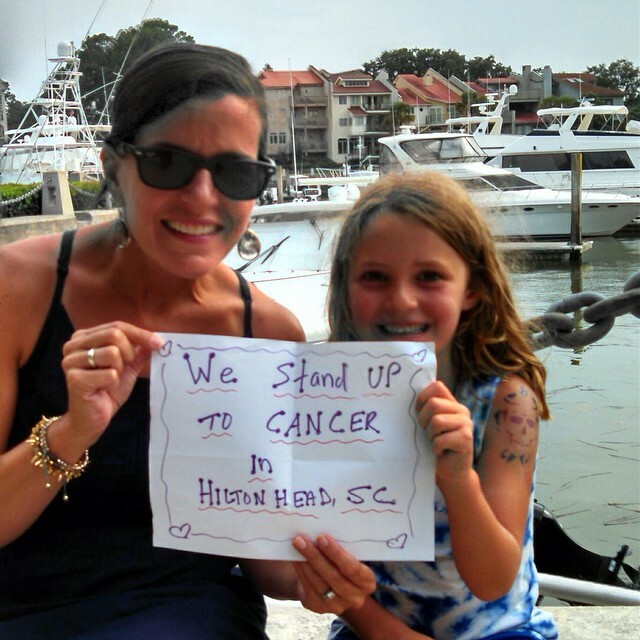 We want everyone to know that they can help the scientists who are trying to end cancer. When a donation is made to SU2C, you’re supporting “Dream Teams” of investigators from different institutions who are working together to get new therapies to patients quickly and save lives. 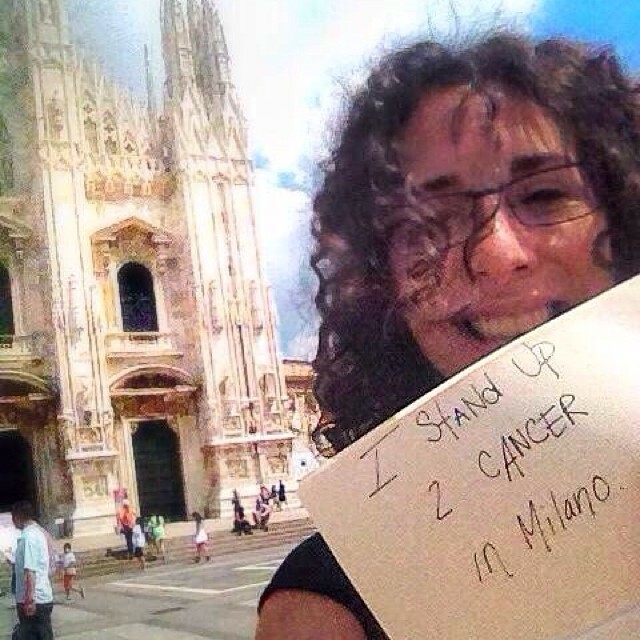 Stand Up to Cancer brings together scientists from different disciplines across institutions to work collaboratively, at an exciting time in the field of cancer research – historically, they often competed with each other. 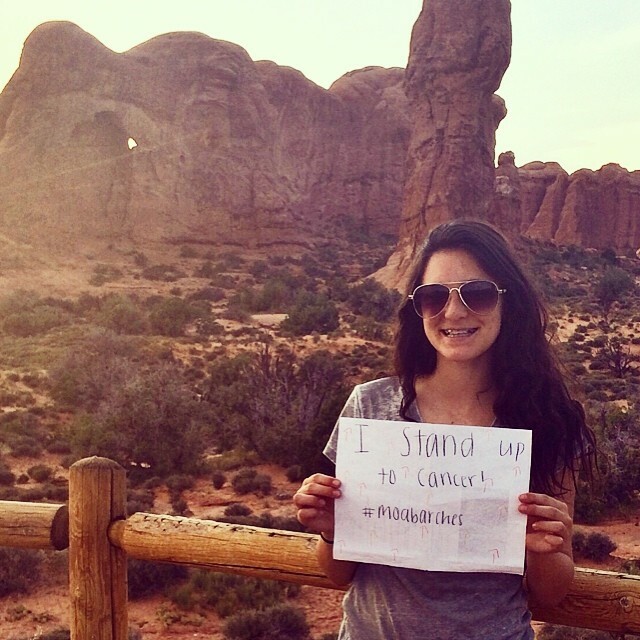 To date, more than $261 million has been pledged to Stand Up To Cancer. As of September 2013, Stand Up To Cancer has funded eleven “Dream Teams” and 26 young innovative researchers who all strive towards the “high reward” of saving lives. They bring together more than 700 researchers from over 100 leading institutions in the U.S. and four other countries to work together. 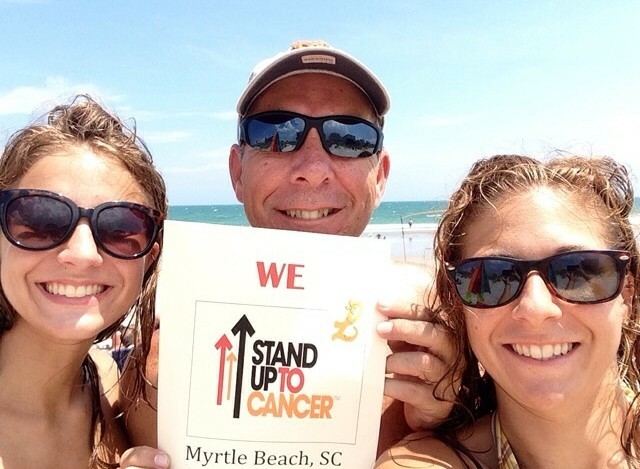 To learn more about Stand Up To Cancer, go to standup2cancer.org. What truly impresses us about Stand Up To Cancer is even though this amazing organization raises millions of dollars of each year and deals with high profile celebrities from the entertainment industry, they celebrate and support our small grassroots event. 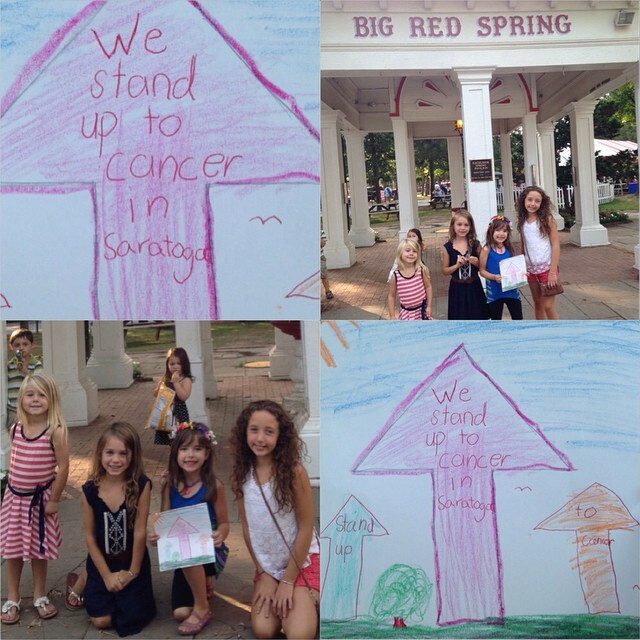 During Year 1, we e-mailed Stand Up To Cancer to let them know that we were planning on doing a fundraiser. Almost immediately Jenny Kuntz, the Director of Operations for Stand Up To Cancer called us to find out more information about it. They were impressed by the originality of our fundraiser, which is why it must have caught their attention. 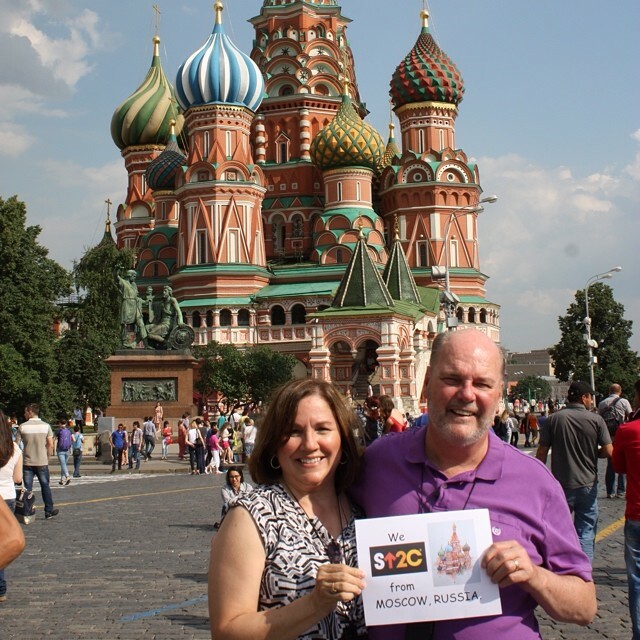 We hadn’t even raised $1000 yet and already SU2C was encouraging. 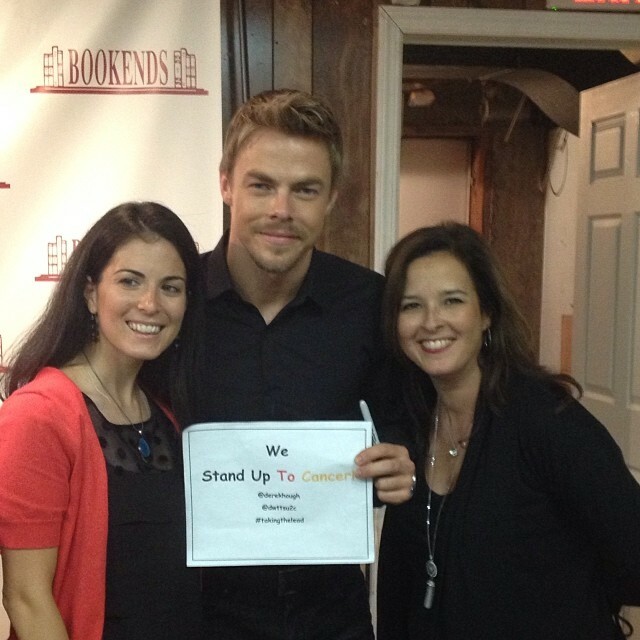 When we were invited to attend the Stand Up To Cancer National Telecast in Los Angeles in 2012, it was like a dream. 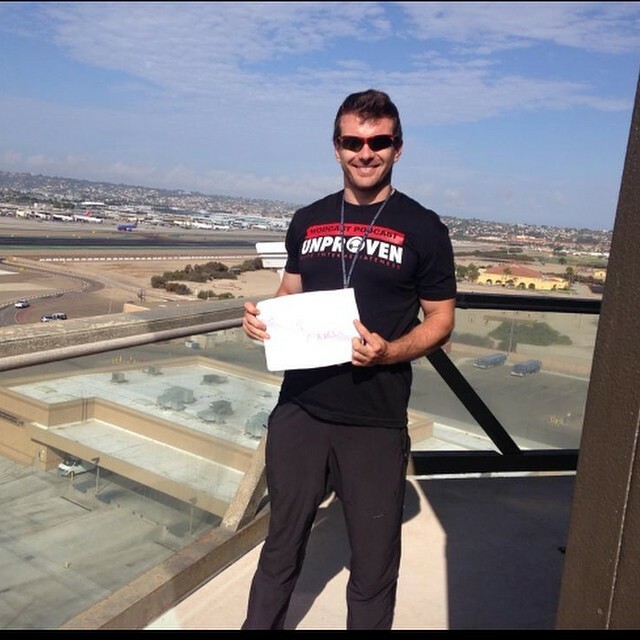 It was held during the first week of school, so after teaching all day, we hopped on a red eye flight at night. 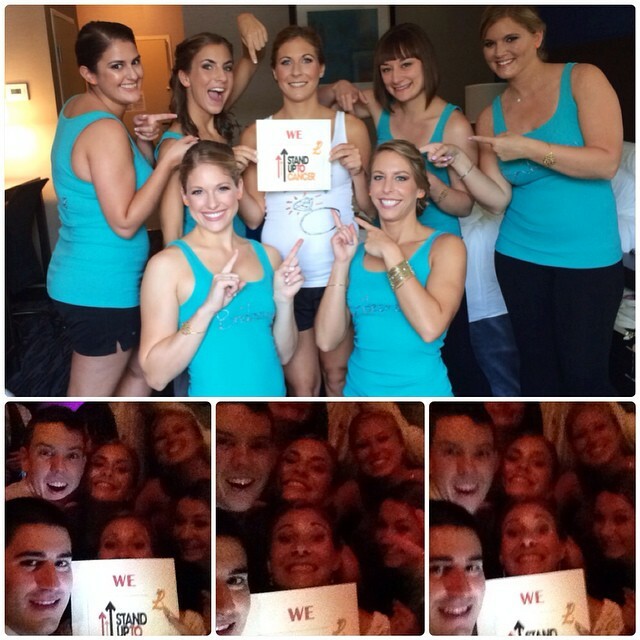 The next day, we were mingling among stars like Gabby Douglas, Jillian Michaels, and Eric Stonestreet. 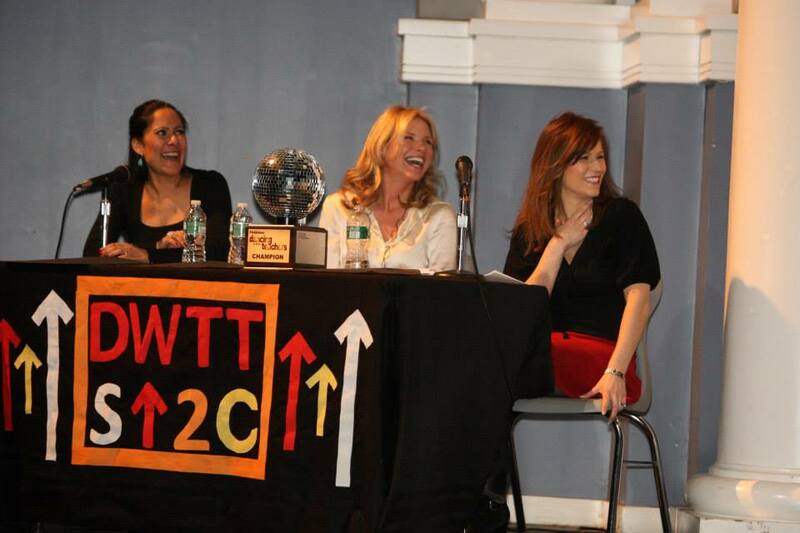 Last year, Kathleen Lobb, one of the co-founders of SU2C, came to Dancing With The Teachers to speak. Ever since we met her, Kathleen has been our biggest cheerleader and many opportunities have come our way through her. Presenting our donation check on Katie Couric’s talk show, passing the baton in the studio at Good Morning America, we sometimes have to pinch ourselves to make sure it is all real. 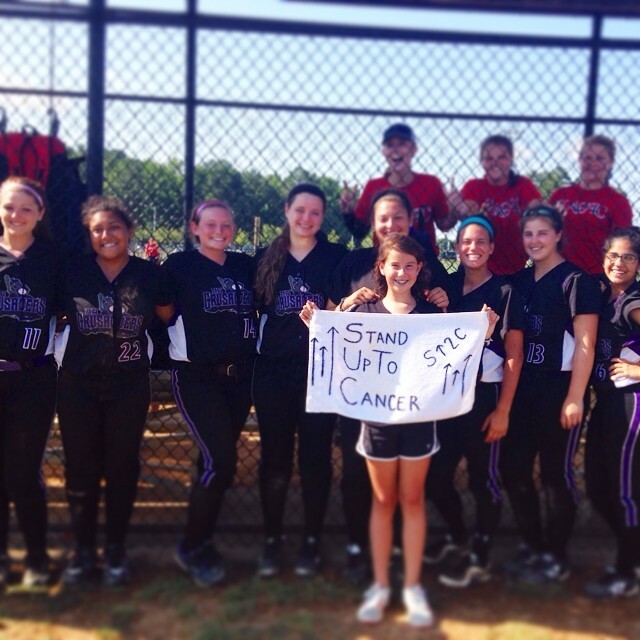 The people at Stand Up To Cancer appreciate every dollar raised. 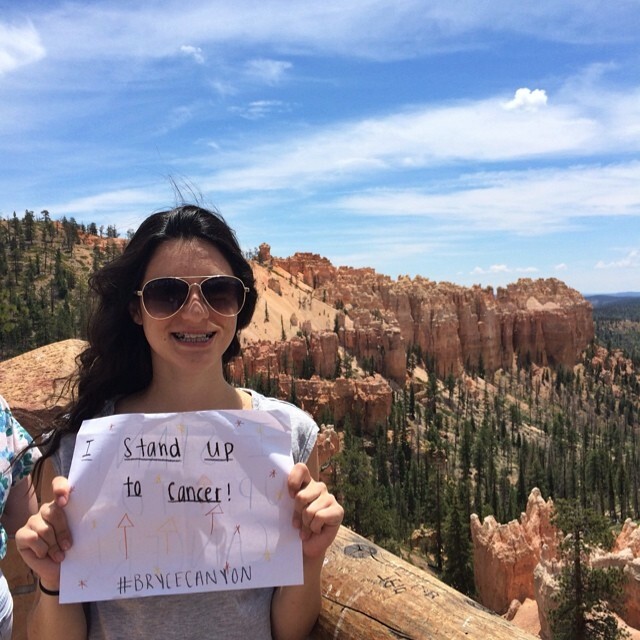 When we attended the Stand Up To Cancer telecast in LA in 2012, we met 15 year old cancer survivor Pearce Quesenberry for the very first time. 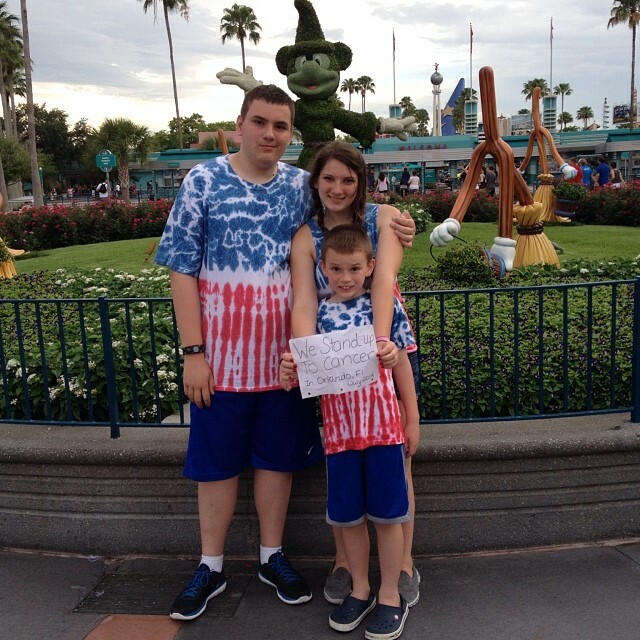 Pearce was diagnosed in 2008 with medulloblastoma, a cancer of the brain. She was 10 years old, and there was only a 30% chance that she would survive. She was treated at the Children’s Hospital of Philadelphia where she received an experimental treatment. 2008 also happened to be the year of the first SU2C National Telecast, and they were looking for a child to feature on the show. 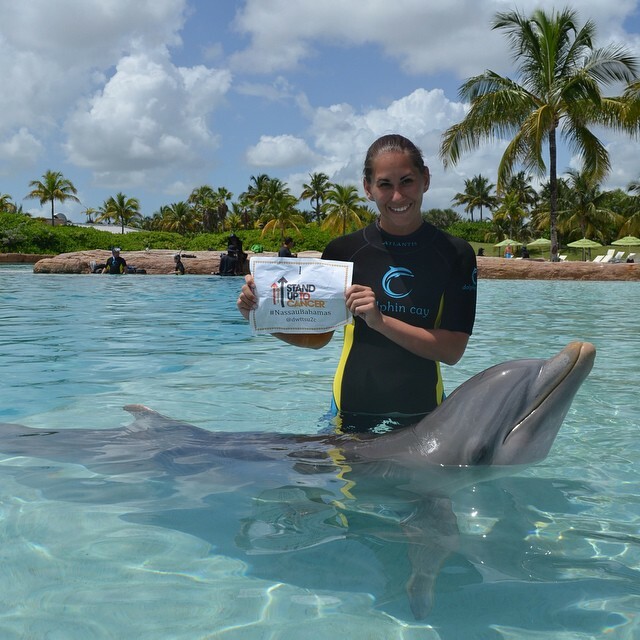 Pearce’s courage, coupled with her receiving this new experimental treatment, made her the perfect candidate. She was featured on the first telecast as being “in treatment”. If you look at pictures of her during that time period, she is almost unrecognizable, yet a smile remained on her face. By the time the next telecast aired in 2010, Pearce’s cancer was gone. This time, she was featured as a “survivor” and became an ambassador for SU2C doing many public speaking engagements across the country. Fast forward to two years later when we met a 15 year-old Pearce at the third telecast. 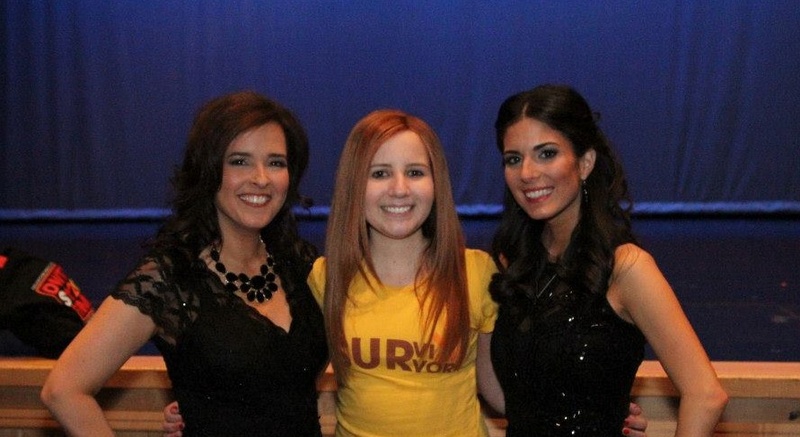 After the show, we noticed a beautiful, vibrant teenager, wearing a yellow survivor shirt, being interviewed by a camera crew. She was so eloquent and poised, and we were instantly drawn to her. We decided to introduce ourselves to tell her about the fundraising efforts that our students were doing back in NY. She agreed to do a short video clip for us in which she thanked our students for the work they continue to do to raise money for SU2C. 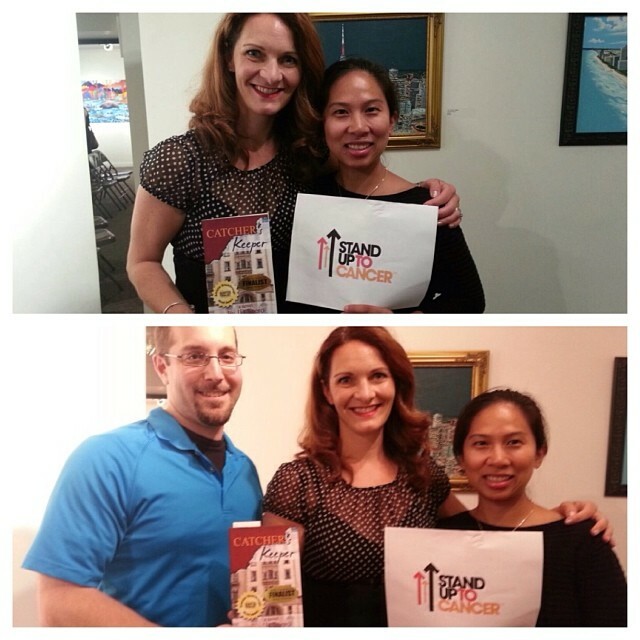 We took a chance and invited her to our 2013 Dancing With The Teachers Event. 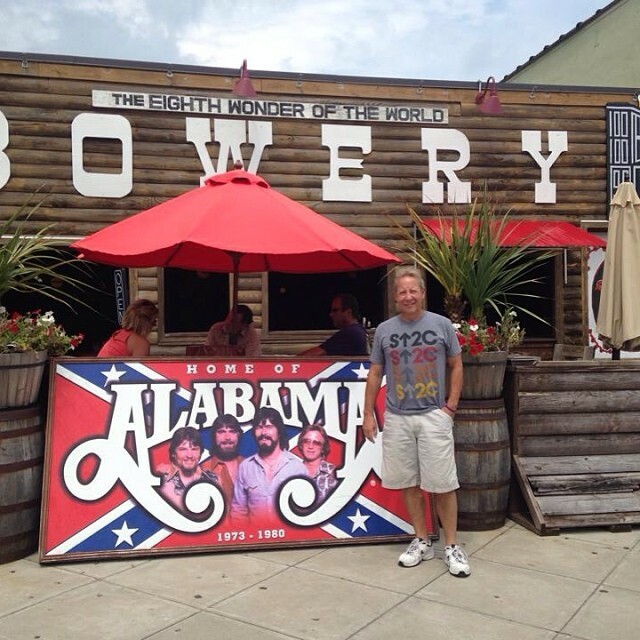 Since we were on the complete other side of the country, we thought this was a long shot. However, to our surprise she began telling us that one of her greatest passions in life is to speak to kids her own age about her story, and that she would love to attend. Her mom told us that they actually live on the East Coast in Delaware, and she gave us a card with Pearce's contact information. A few months later we sent Pearce’s mom an e-mail, and were overjoyed to hear that Pearce remembered us. They drove from Delaware through an impending snowstorm for Pearce to speak at our event. 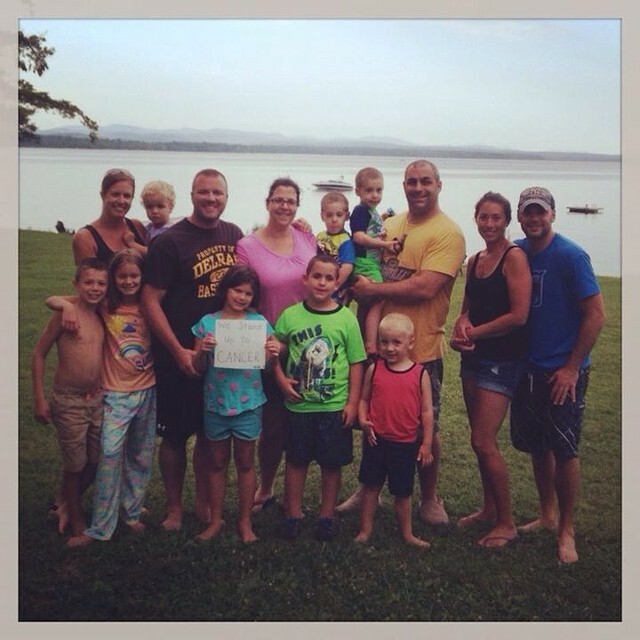 The Bricktown Inn, a bed and breakfast in Haverstraw, NY donated a complimentary room for the Quesenberrys. Pearce held a special assembly before DWTT with the student fundraisers in the FMS library. She has touched our community in profound ways, as our students and teachers look up to her as a hero. One of our DWTT student leaders even designed a special survivor quilt square for Pearce. We were honored that she came back again this year to speak at our event both nights. 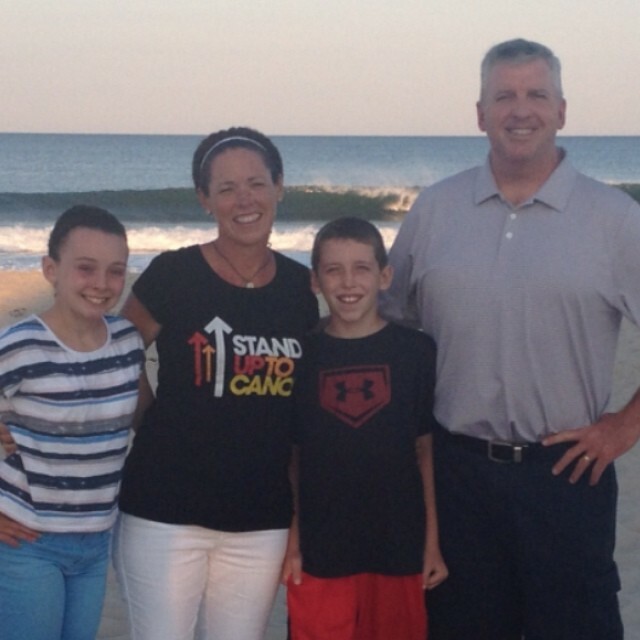 Pearce has spoken candidly to us about how the treatments were very taxing on her body. She went through 31 rounds of high dose radiation treatments to her brain and spine, as well as chemotherapy and stem cell transplants. 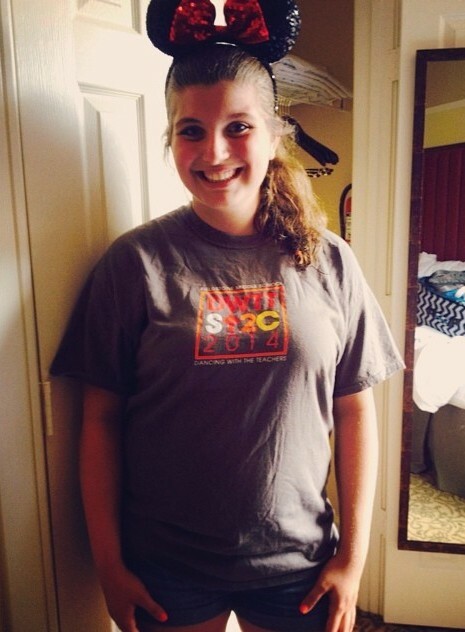 The side effects from the treatments made her very sick, tired, and she lost a lot of weight, however, through it all, Pearce knew that she must not lose hope. She is very passionate about advocating for new treatments and less toxic drugs that will not cause so many life-long side effects. As Pearce wrote in her recent Huffington Post article, “I get to pick any hair color or style I want because I will never have any of my own... thanks to all the radiation and chemo”. Although there was no evidence of her cancer, there was still a high probability that it would return. Pearce reached a milestone last October - her five year anniversary. The doctors gave her the good news that she was officially in remission. 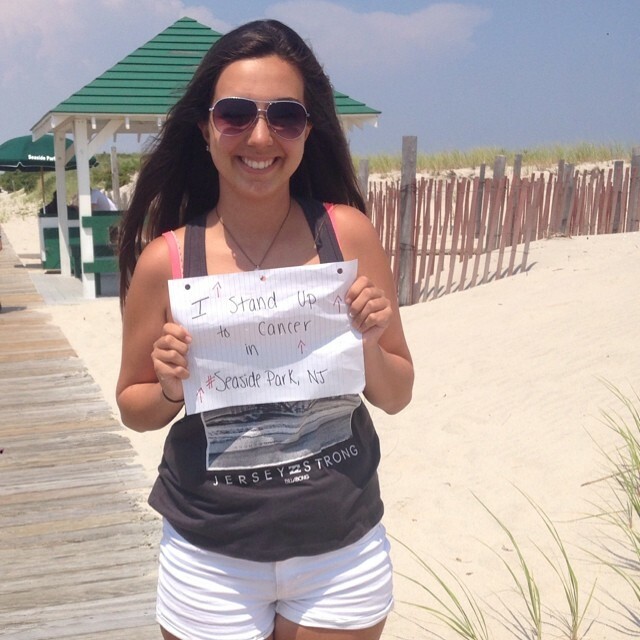 Pearce started her own non-profit organization, The Pearce Q Foundation, which raises money for children with cancer. 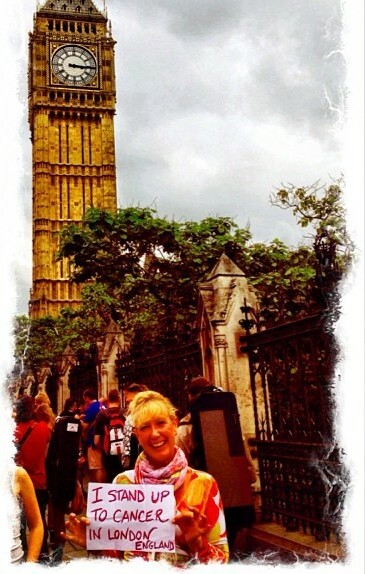 For more information, please visit her website www.pearceqfoundation.org. We’ve noticed that you have received some support from various Dancing With the Stars pros – Tristan MacManus, Sasha Farber, and Emma Slater followed you on Twitter and Tristan also tweeted a lovely show of support a few weeks ago. Little things mean a lot! 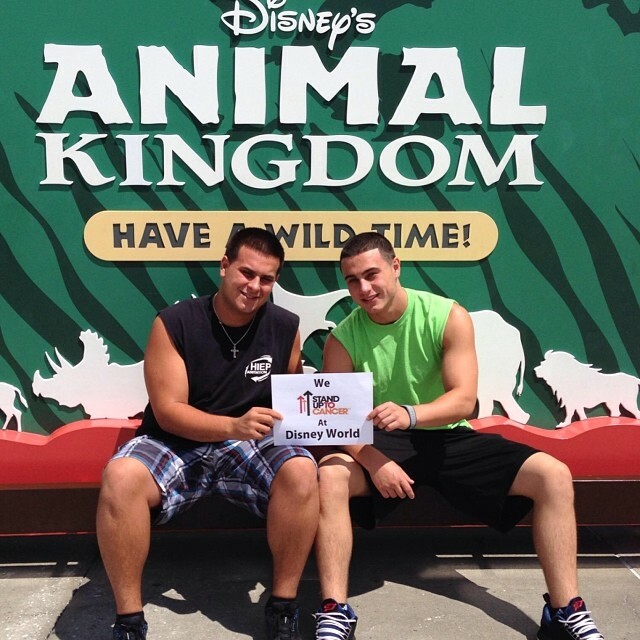 Even though we are just the fan support team for Tristan, we want to help any way we can. 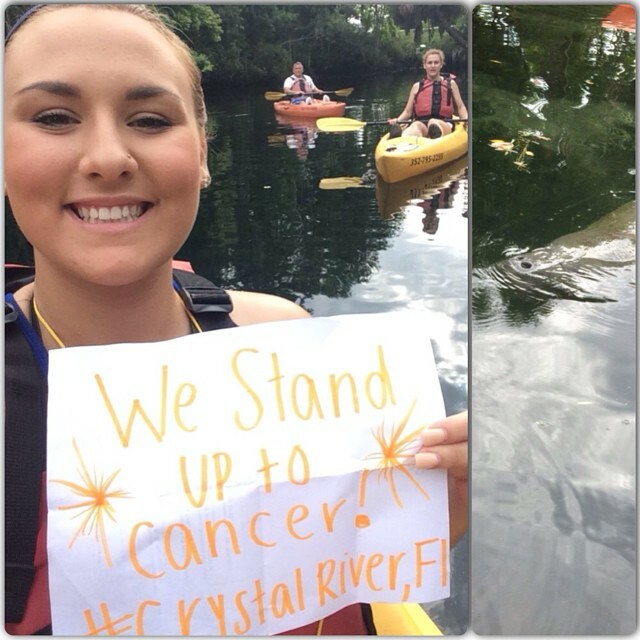 Tell us what we can do to help spread the word about this amazing cause. Yes! In our quest to find celebrity judges this year, we started tweeting at numerous Dancing With The Stars pros. It has been very exciting to see that Sasha Farber and Emma Slater have started following us. We have received some very supportive, positive comments from Anna Trebunskaya and Henry Byalikov, but one of nicest came from Tristan MacManus. When we posted a picture of Lorraine’s shoes and spoke about our plan to have them on stage with us, Tristan tweeted, "Great job, keep up the fight, all the best to you and Lorraine Brenner, I stand up for you all!" This really meant a great deal to us because it was so personal and very heartfelt. We would love for you to get the word out about our event in any way that you can. It would mean a lot for our idea to reach as many people as possible especially moving into next year. Please re-tweet our posts, encourage your followers to follow us on Twitter https://twitter.com/DWTTSU2C and Instagram http://instagram.com/DWTTSU2C. Find us on Facebook “Dancing With the Teachers: An Event to Benefit Stand Up To Cancer” https://www.facebook.com/dancingwiththeteachers. Direct people to our website www.dancingwiththeteachers.com for more information. 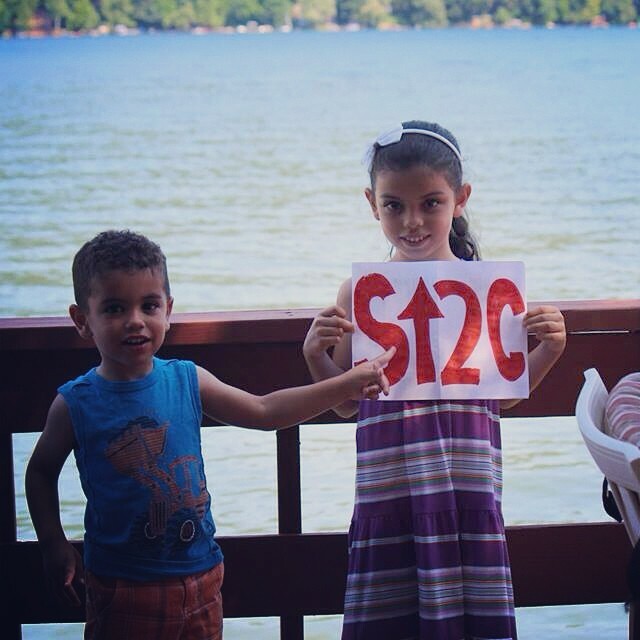 Anything you can do to encourage people to donate to SU2C. 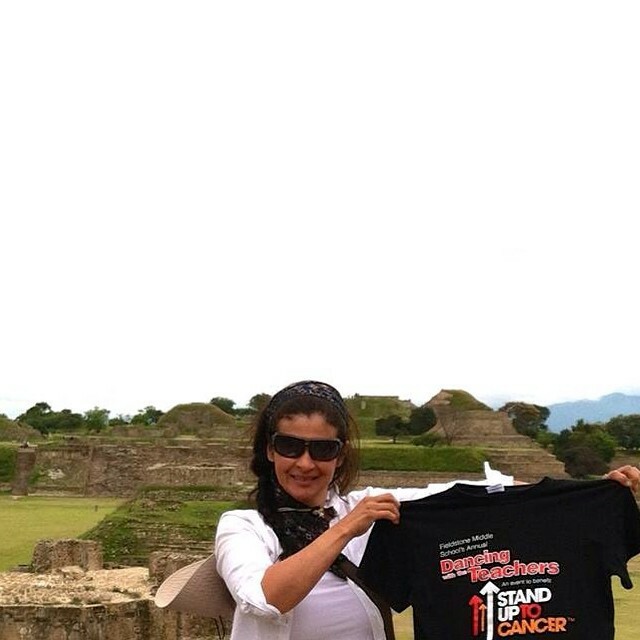 All it takes is action...let’s all unite, dance, and defeat cancer together! As you prepare for the next Dancing With the Teachers show, we would like to help get and keep the word out. Feel free to write a blog for us at any time on the progress, how the plans are coming along, and we will post it in a separate location on the site. Also, we would love to do follow up interviews as the months go by to see if we can help in any way. Article: Katie Couric, Huffington Post- "5 Ways to Make a Difference on World Cancer Day"
Article: Sherry Lansing, Huffington Post- "Stand Up and Dance"
All photos below are provided courtesy of DWTT and are fully credited to Barry Sabino and Sabrina Nicosia. Click on any image to enlarge.